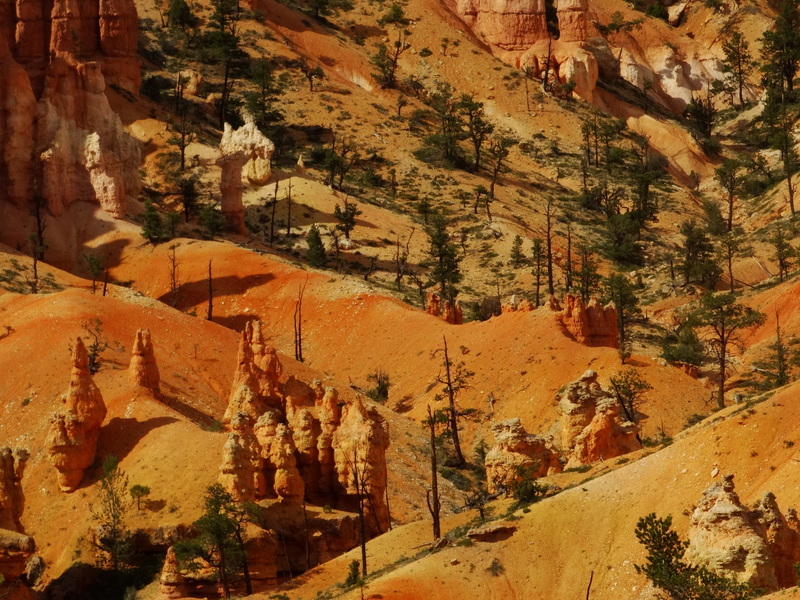 Every single mile of our drive to Bryce National Park was beautiful. 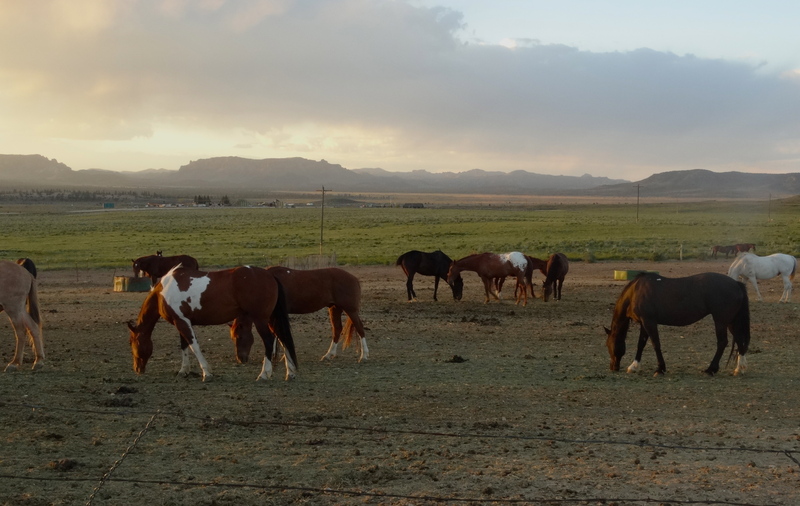 It was perhaps the most scenic drive of our tour through Utah’s Grand Circle. 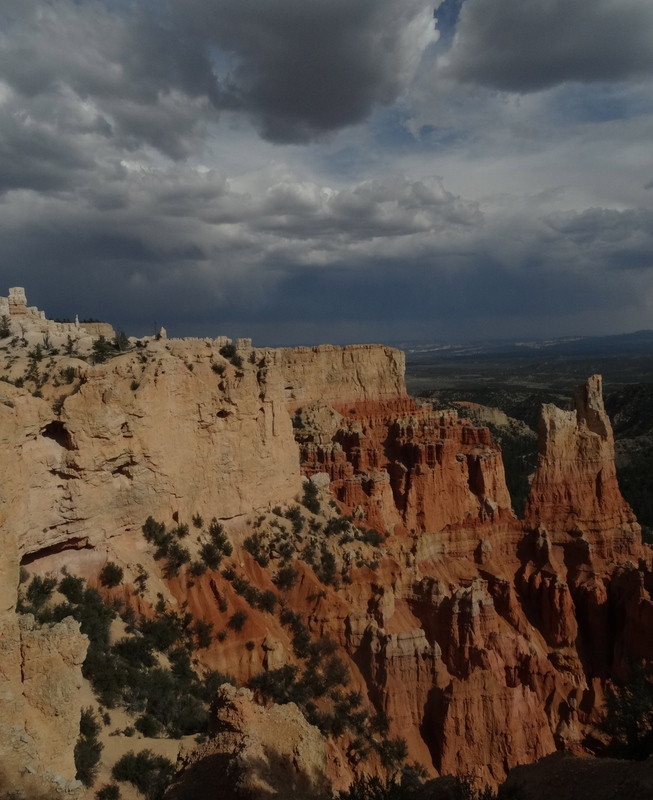 We drove along Hwy 12 to Escalante then to Henrieville and on to Bryce Canyon City. There were beautiful valleys throughout with many places along the way to camp or B&B’s for those that prefer a less rustic experience. 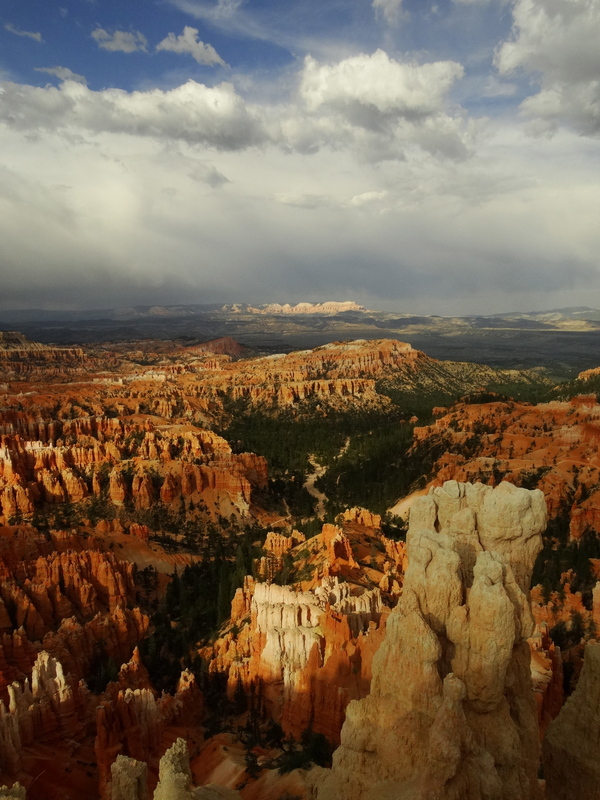 When we arrived at Bryce we heard the news of Maya Angelou’s passing. 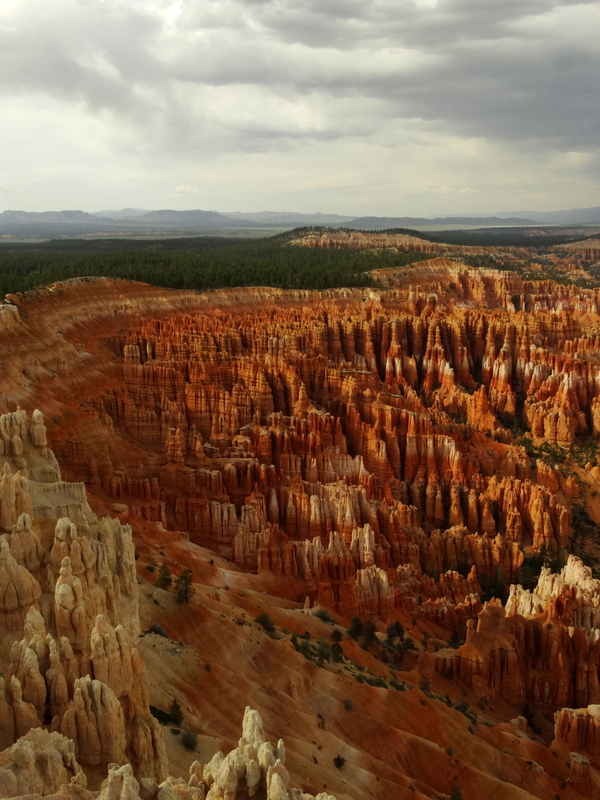 For us it was a day of exploring Bryce Canyon’s natural beauty while reflecting upon the amazing journey of Maya Angelou’s life. It was a wonderful way to celebrate a life well lived. 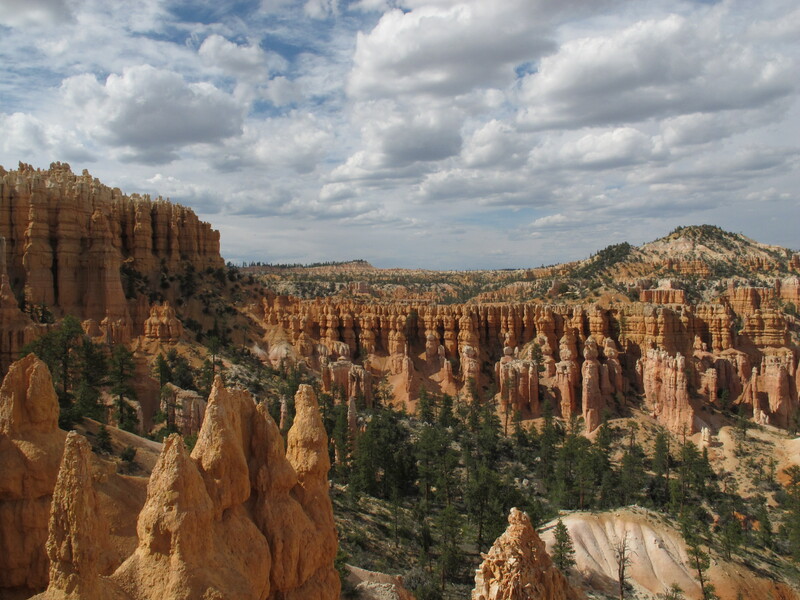 Our first visit to Bryce was in the spring of 2008. There was still snow on the ground and the winter chill was still in the air. 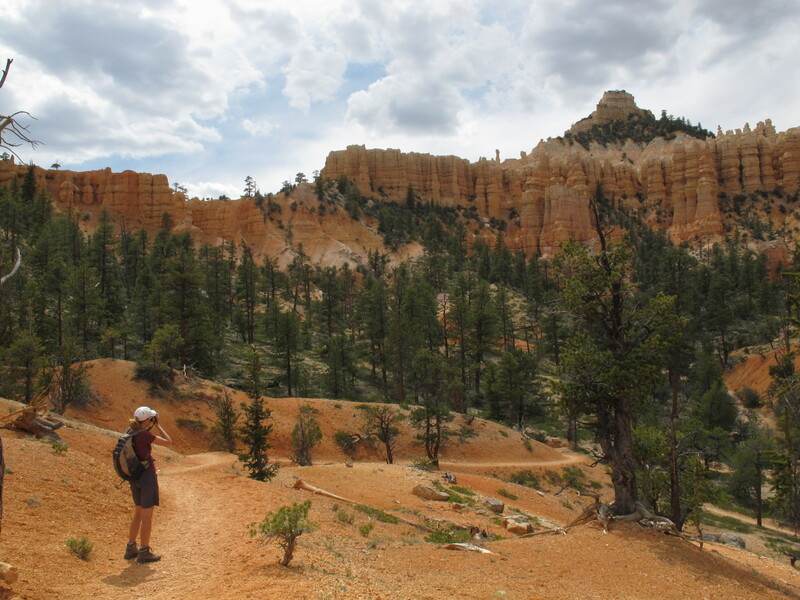 We didn’t spend much time hiking so I was looking forward to exploring the canyons of Bryce. We spent the day stopping at all of the scenic overlooks. The view points were crowded with tourists but the views were spectacular. 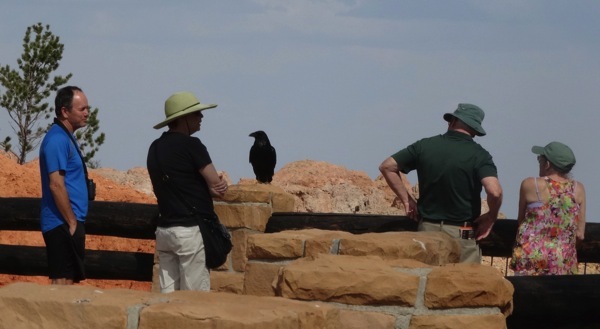 There was a raven with a crowd of admirers begging for food at one of the viewpoints. The bird had no fear of people. When a car pulled in the raven would fly to the front grill of the car to pick out whatever he could find there. Tourists happily feed the wildlife without realizing the harm to the animals making them dependent on unhealthy human food. 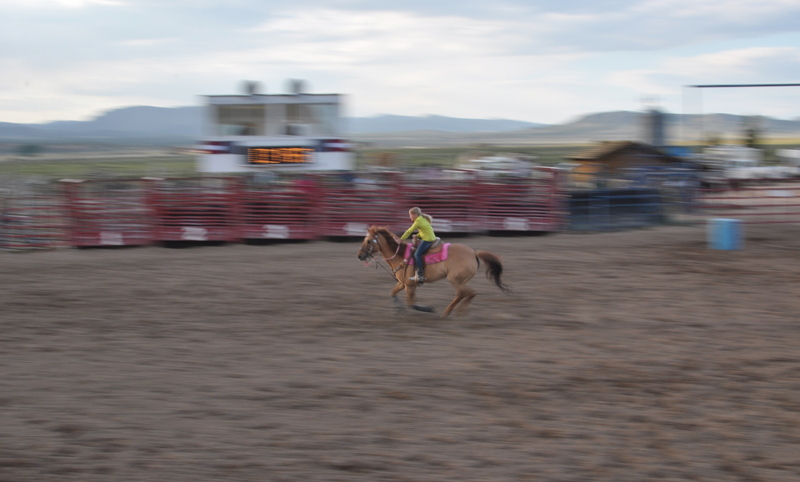 They lose the interest in hunting and teach their young the same behavior. 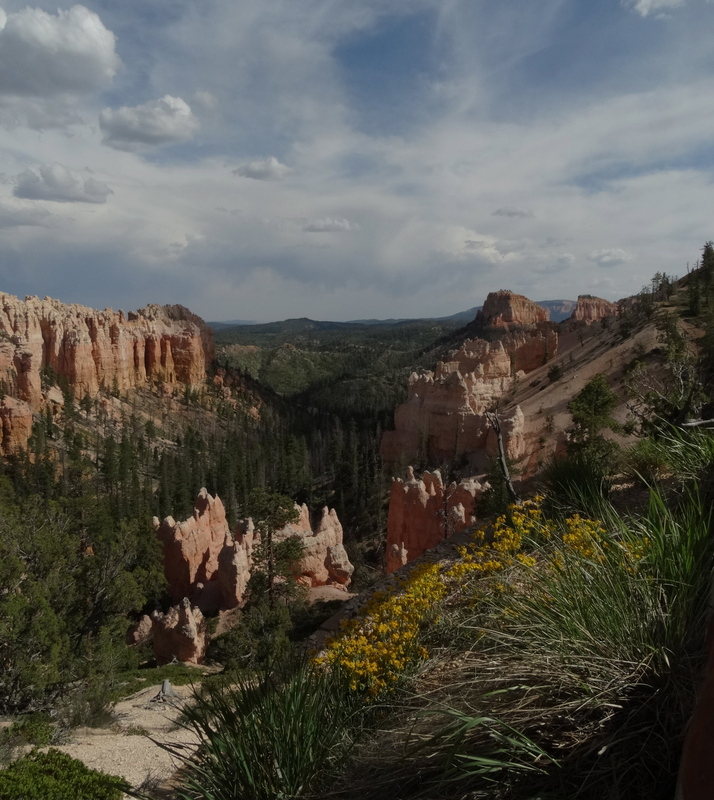 The following day we hiked into the canyon along the Fairyland Trail. 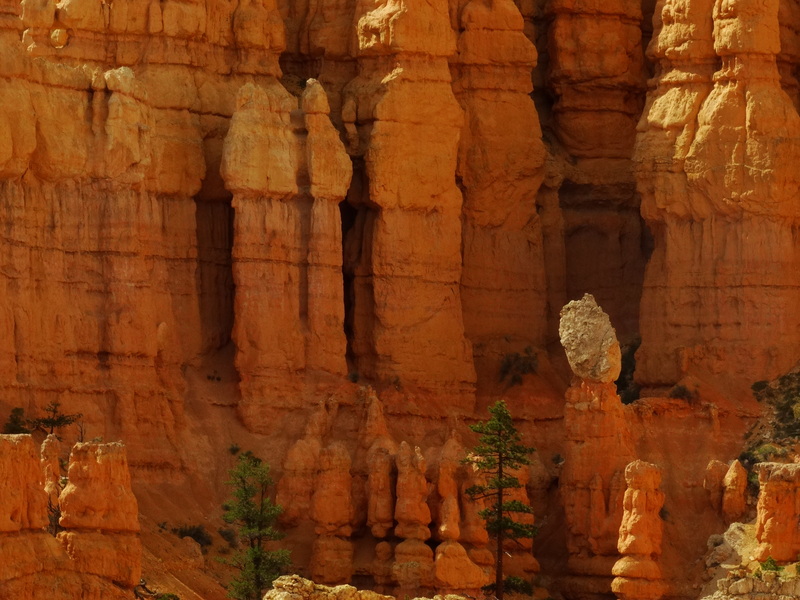 The hoodoos looked like fairy castles. The views captured my imagination and looked like a magical land of fairies that I dreamed of as a child. 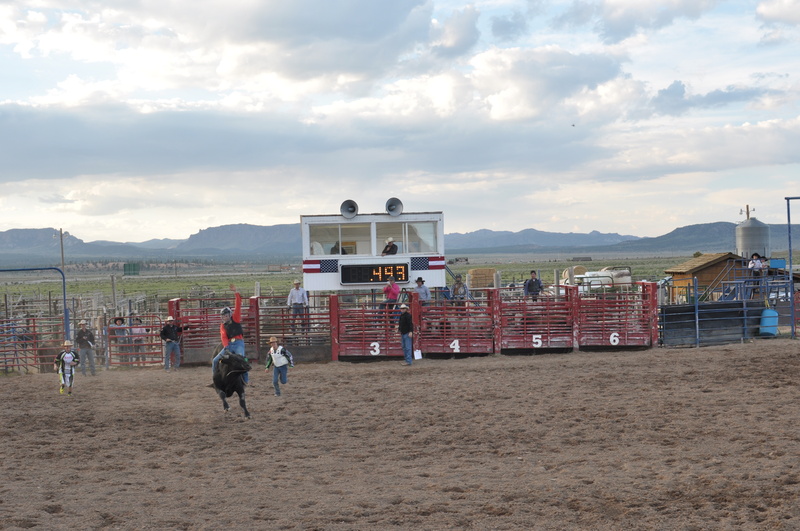 After our hike we went to our first rodeo. 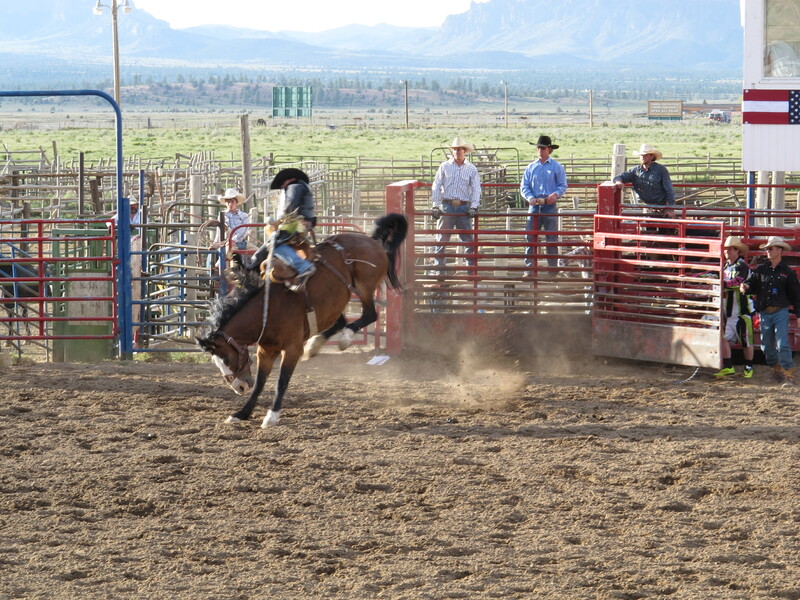 It was the Bryce Canyon Country Rodeo at Bryce Canyon City. This is an interesting little town that appears to be owned by one company, Ruby’s Inn. Everything that we saw was a Ruby’s Inn property. 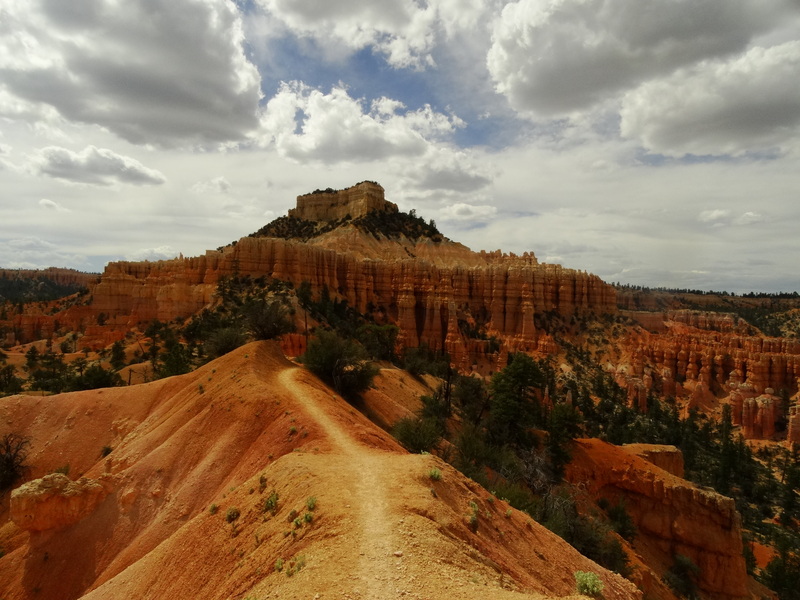 The town is just a few miles outside of Bryce National Park and has a monopoly on the tourism coming through the area. We’ve never seen anything quite like this company town. 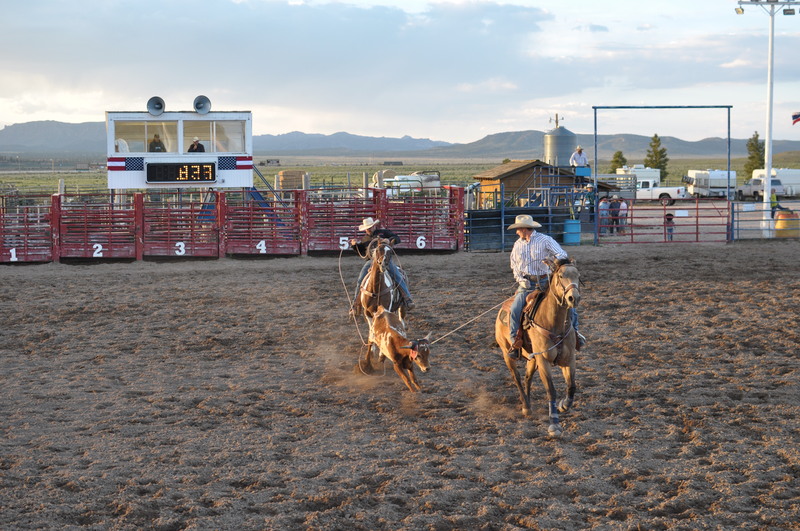 I can’t imagine staying on a galloping horse and roping a calf at the same time. She’s only about 9 years old and enjoying every second of her event! Relaxing after the evening’s performance. After Bryce we drove to Las Vegas along Zion-Kolob Road which winds through part of northern Zion. Rosemary and Bill who we met in Zion recommended this backroad. It was a beautiful road and made for a beautiful day trip to Las Vegas. 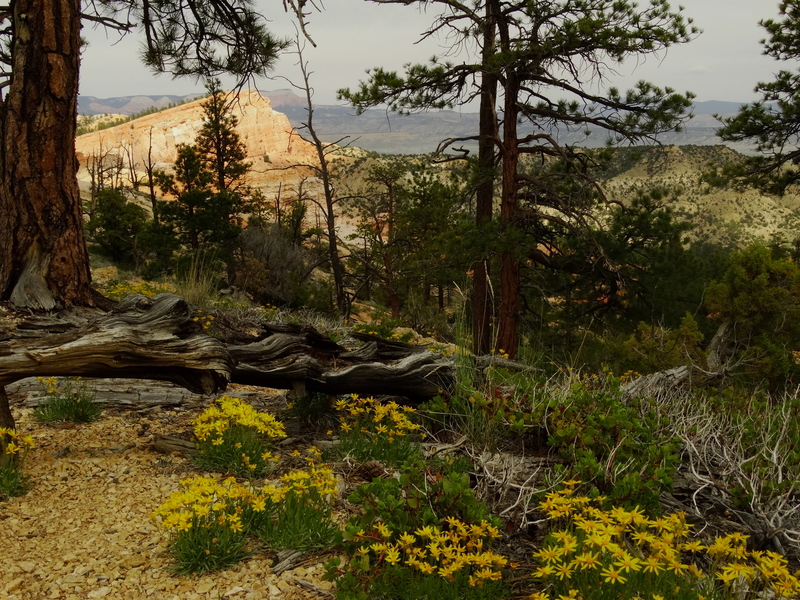 We only spent a day driving through Capitol Reef National Park but it was a beautiful drive. We forgot that we came through this little visited national park in 2008 during our drive to Moab from San Jose, CA. We did much of the “Grand Circle” loop in 2008. 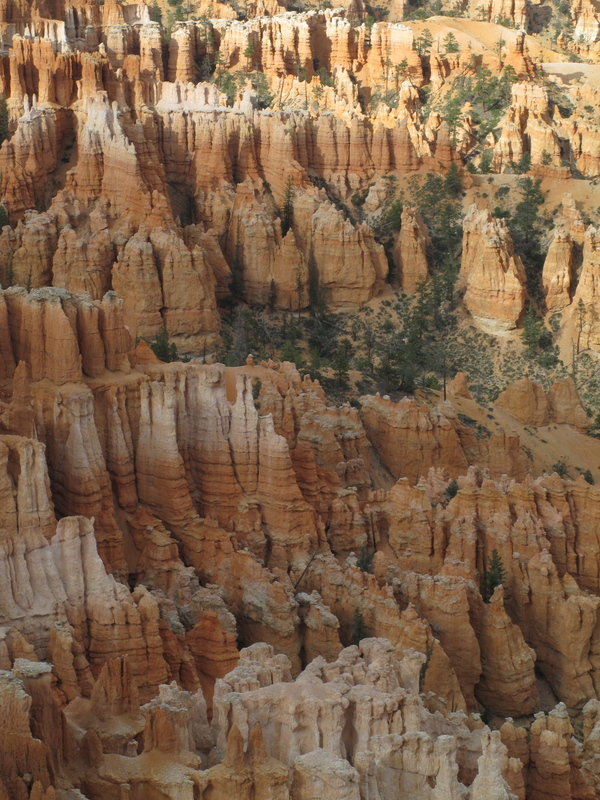 Our version then included Zion, Bryce, Capitol Reef, Canyonlands and Arches National Parks. 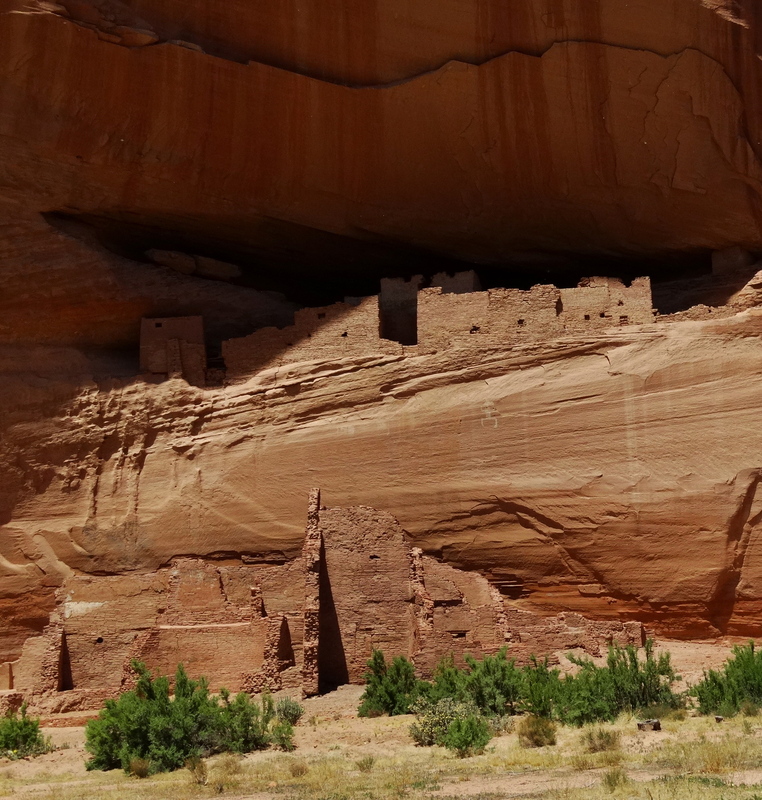 This time around we added the national monuments within the Navajo Nation (Monument Valley, Canyon de Chelly and Navajo National Monument). We missed seeing the Grand Canyon in both tours. From Moab we took 191 north to 70 west then 24 west into Capitol Reef. The drive gets interesting once you turn onto Hwy 24; before that it’s fairly barren. Capitol Reef is a fairly small park and very narrow. 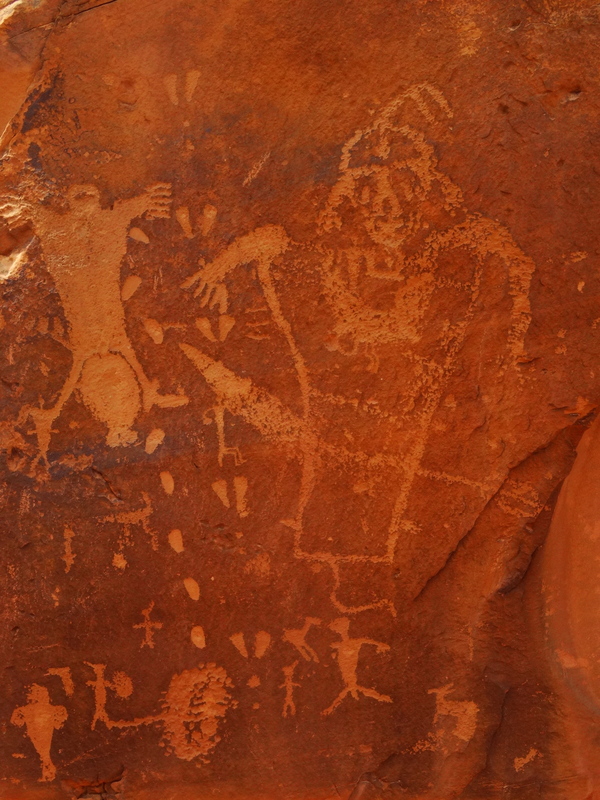 There are some interesting petroglyphs on the way into the visitor center. This time through, we decided to take our time and drive the Notom-Bullfrog Road through the park which runs along the Waterpocket Fold. This is an almost 100 mile warp in the Earth’s crust created between 50-70 million years ago. It amazes me how geologists are able to think about time of this magnitude and decipher the events that caused the features that we see today. I won’t try to go into any more detail about the “how” of the geology but I will share with you the resulting beauty! We found a nice place to camp in the Grand Escalante-Staircase BLM land which borders the western side of Capitol Reef. It was a beautiful spot for us to spend the night. While on our evening stroll through the area we surprised a horned toad. It jumped out of its hiding place across the path ahead of us. Although I saw where it settled in along the path I could barely see it. Can you find it in this photo? We had a relatively uneventful day at the Moab Art & Wine Festival then picked up groceries and went to set up camp again at Sand Flats in Moab, Utah. Our campsite gave us a front row seat at the 4×4’s passing through the Fins & Things trail. After dinner, we decided to take a walk along the trail to see just how technical it was and watch how the other vehicles handled the terrain. Darryl and I were walking through a section that, to me, looked impossible for any truck to climb but with all of the rubber on the rocks, it was obvious that I was wrong. I’m capturing video footage of this craziness. This is the first time this couple had their new jeep out on the trails. They were loving its performance! 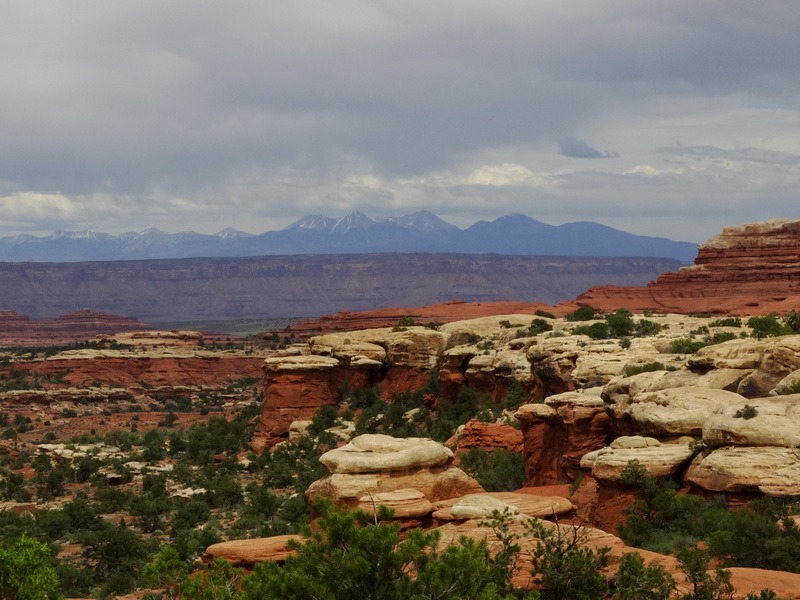 The next day we set out for a drive through the La Sal mountains. It was threatening to rain all day but made our day in the mountains even more beautiful. We took 191 south out of town to 46 east. We took the forest roads through the mountains (FR028 to FR0073) toward the La Sal summit. 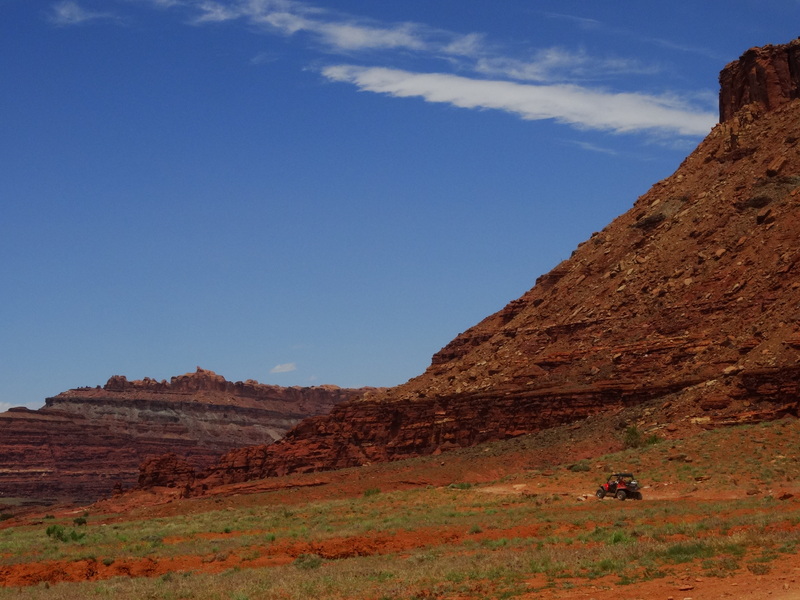 One of the draws to the Moab area is the variety of topography within a short distance. 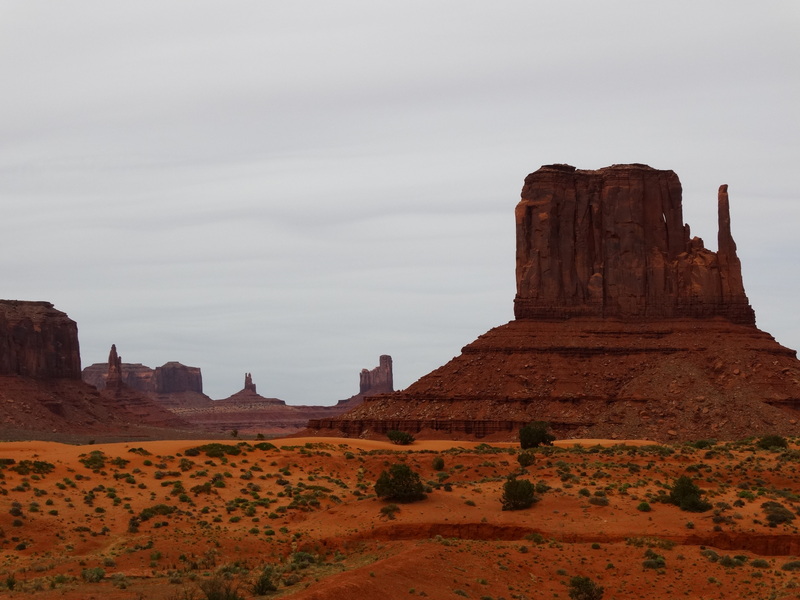 You have the desert, rivers, canyons, arches and mountains all within an hour’s drive. And this day would be all about mountains, forests, aspen and snow. It was a welcome change to the past couple of months. After a long day in the mountains we decided to take the night off from camp food and ate out at the Moab Brewery then returned to our campsite at Sand Flats. The next day we decided to rent a UTV (Utility Task Vehicle) and take it on Hell’s Revenge trail. It would be a fun way to experience these 4×4 trails without putting our vehicle at risk. It’s the only home we have for now and I preferred to keep it safe from a potential roll-over. 🙂 We opted for the T-Rex 4×4 Tour with the Moab Tourism Center. The tour was on a Kawasaki Teryx 4 and we were able to drive it ourselves. The tour wasn’t until early evening so we set out to get a little cardio workout at the Amasa Trails along Kane Creek that we saw earlier in the week. The run was challenging given that we haven’t been working out regularly but the views were beautiful. There were quite a few people out with their 4×4 vehicles. They were of all makes and sizes. There was a very ledgy section of trail at the finish of our run that we had to walk up. During the last couple of miles of the run, we would cross paths with a group of 4×4 trucks that were on the 4×4 section of the trail. They were taking awhile to get through the trails but we were hoping that we would see them drive this ledgy section which, to my inexperienced eye, looked impossible to clear in any vehicle. Sure enough, about 10 minutes after we finished our run we saw the vehicles approaching! The first vehicle made it look pretty easy to climb. Some of the others had a little more difficulty. After we watched all of the vehicles clear the section we had to get going to make it to our TRex 4×4 tour along the Hell’s Revenge Trail. We thought that we would each get our own UTV but found out that it was one UTV for two drivers. Darryl did most of the driving and then I got in on the fun about halfway through. These little machines can go up practically anything! It was such a fun trip riding along the slick rock trails and getting out to sections of trail that I wasn’t able to see on our mountain bikes when we did Slick Rock trail. 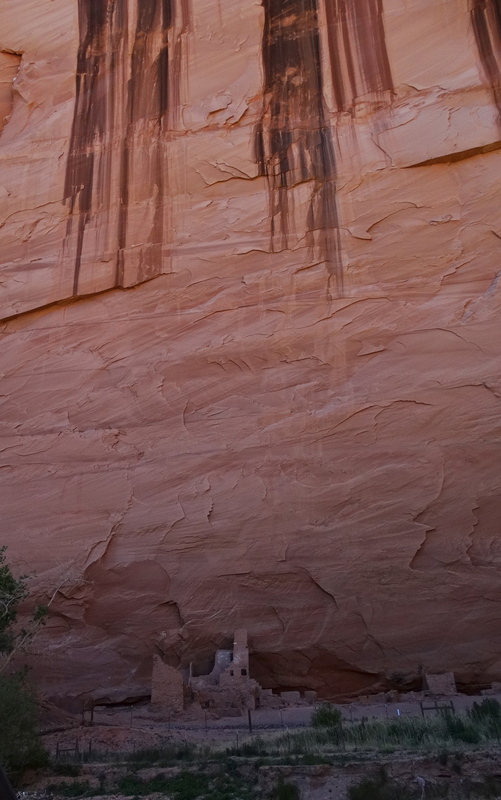 We had a blast and would recommend a tour like this if you make the trip to Moab. 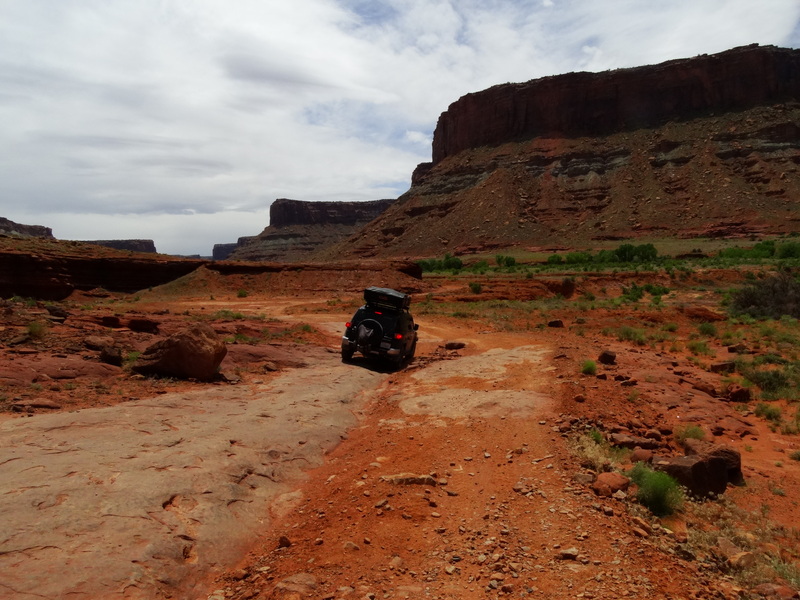 After our UTV tour we had dinner at the Moab Diner then went back to Sand Flats and called it a night. This was our last night in Moab. It’s a wonderful little town which never disappoints us. It’s one of the towns on our list of places to move to after our trip. We spent some of our time here looking at the neighborhoods and talking with the locals about the culture. The housing prices were reasonable but then again, I think that after living in the Bay Area, most anyplace would seem reasonable! We love the outdoor activities and the weather is ok most of the year. The summers can get pretty hot! 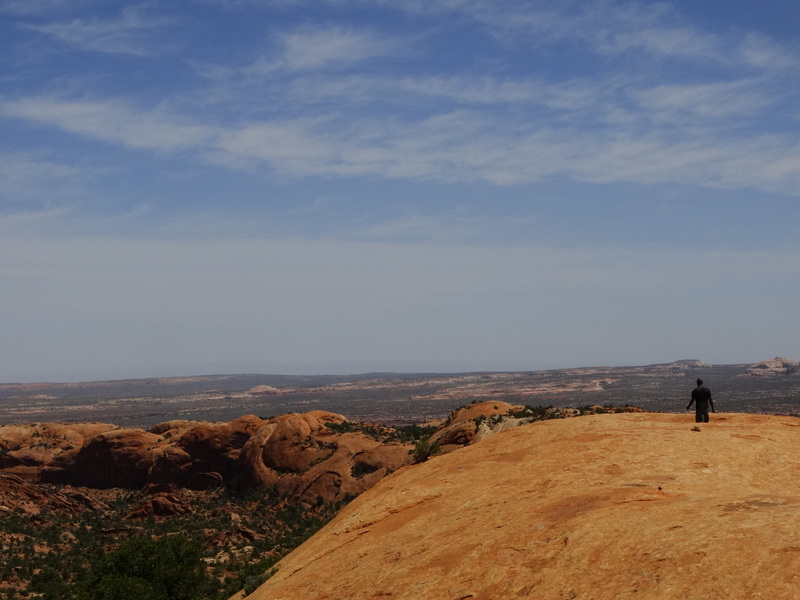 It will be a tough choice for us when it comes down to selecting our new home but it’s nice to know that there are some great options to choose from like Moab. 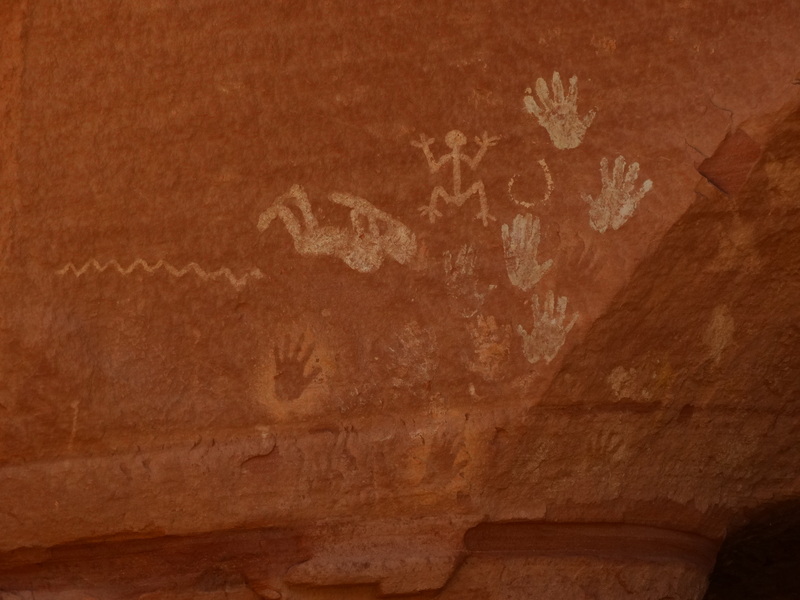 Canyonlands National Park consists of four districts; The Maze, Islands in the Sky, Needles and Horshoe. 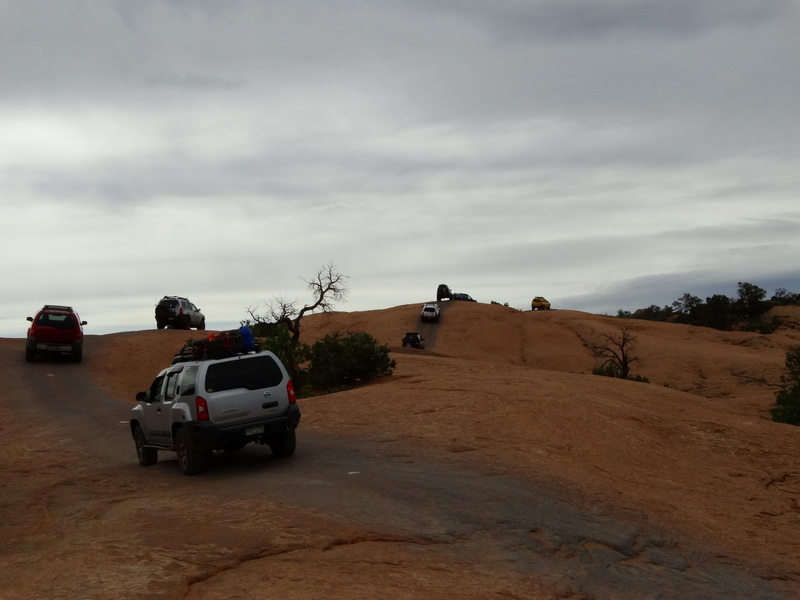 Only two of them, Needles and Islands in the Sky, are accessible by 2WD vehicles. These are the two that we visited. The others are fairly remote and require a few days to travel to them. 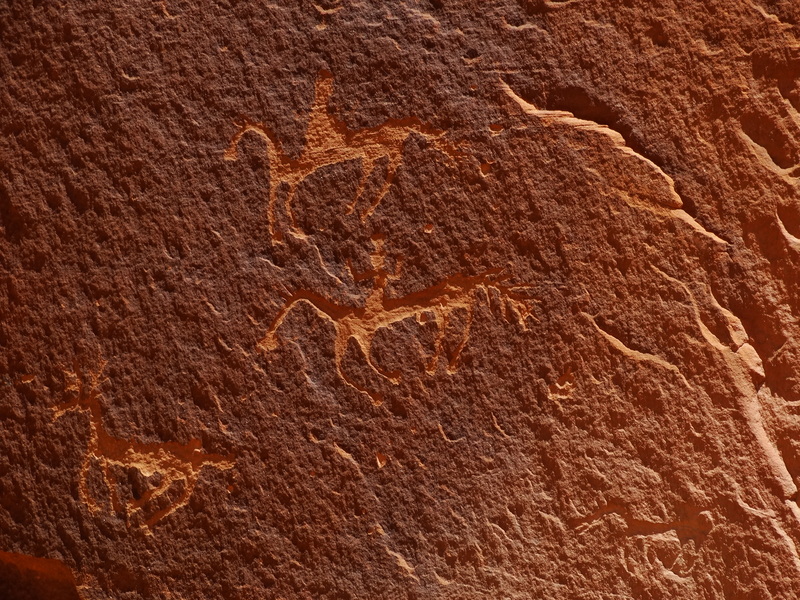 Someday we want to visit the Horseshoe district to see the Great Gallery rock art panel where there are life size pictographs. 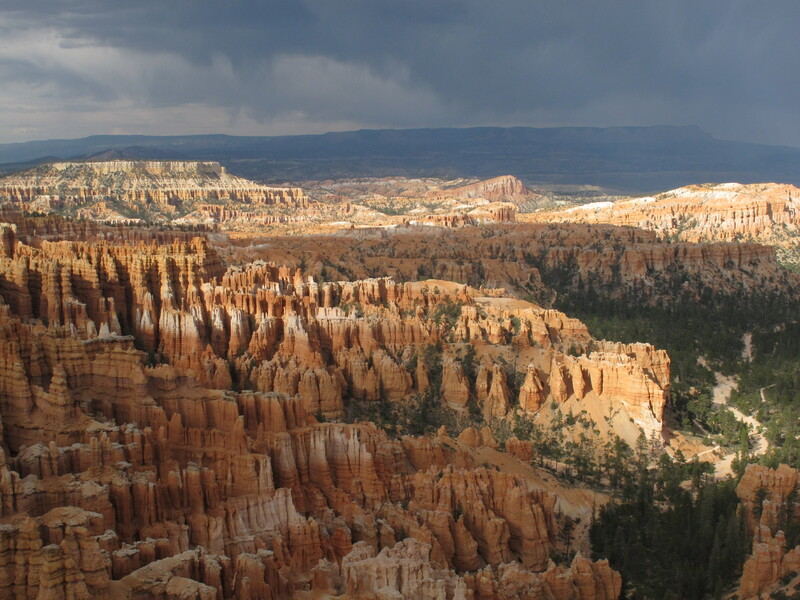 The Needles district is very distinct from Islands in the Sky district. It is green with vast valleys covered in grass and wild flowers with expansive views of distant rock formations and mountains. We were here in late May during an unusually wet and cool year so our experience may be out of the norm. Given all of our crazy weather patterns perhaps unusual weather patterns are the new normal! Beautiful floral display along the valley. Driving into Needles along State Route 211 you pass a massive rock known as Newspaper Rock. 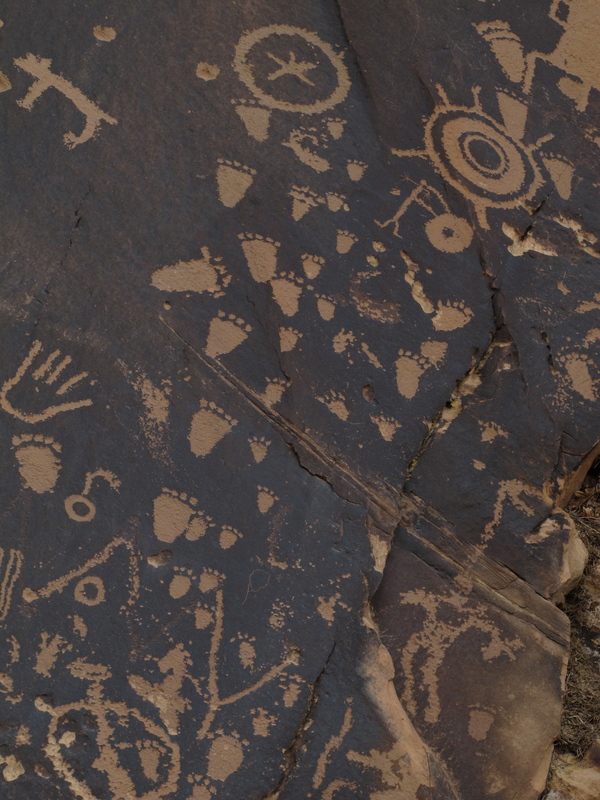 It’s a 200 sqft rock that exhibits one of the largest and best preserved group of petroglyphs in the Southwest. Newspaper rocks reflects the passage of time and people throughout this area. The earliest of its designs dates back 2,000 years. We took our time driving into Needles, stopping for many photo ops along the way. We were absolutely stunned by the beauty of the place. I’m not sure we would have stopped here if it had not been for the recommendation of Rosemary and Bill who we met in Zion. These tips from fellow travelers have led us to many beautiful spots that we would not have discovered on our own. We had a quick lunch at Canyonlands Needles Outpost which is privately owned and just outside the park boundary only a few miles before the fee station. There is not any food within the park so this is your only option. Given the remoteness, they have a surprisingly wide variety of food stocked on their shelves and a decent grill / sandwich menu. Our first stop after the visitor’s center was Elephant Hill. The parking area was very crowded with about 50-60 cars filling all of the spots. This was the most crowded spot in the park due to the density of trailheads starting from this point. Once you started walking along your chosen path the number of people thinned out quickly. Taken along Elephant Hill trail. 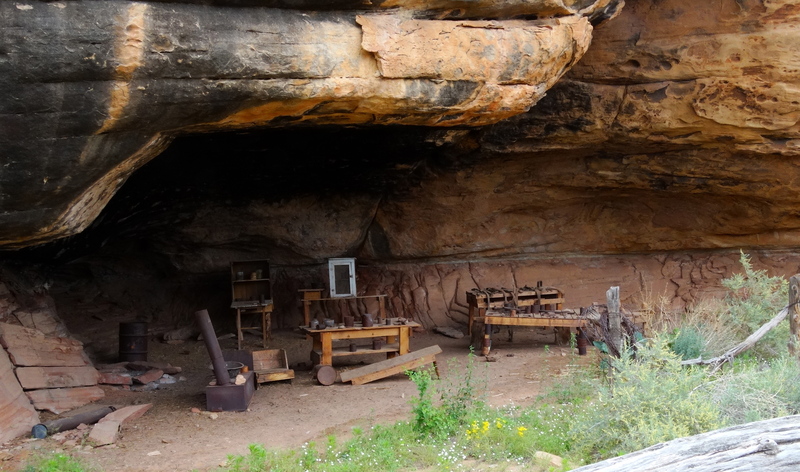 We took a walk along Cave Spring Trail which included pictographs, a historic cowboy camp and a couple of wooden ladders along the trail’s route. The ladders were actually part of the trail. 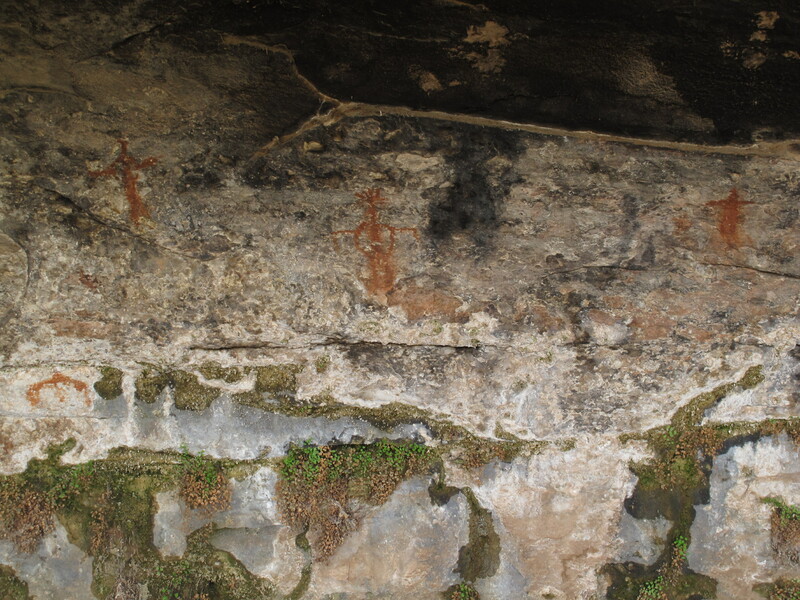 Pictographs and a tiny hanging garden along Cowboy Springs Trail. 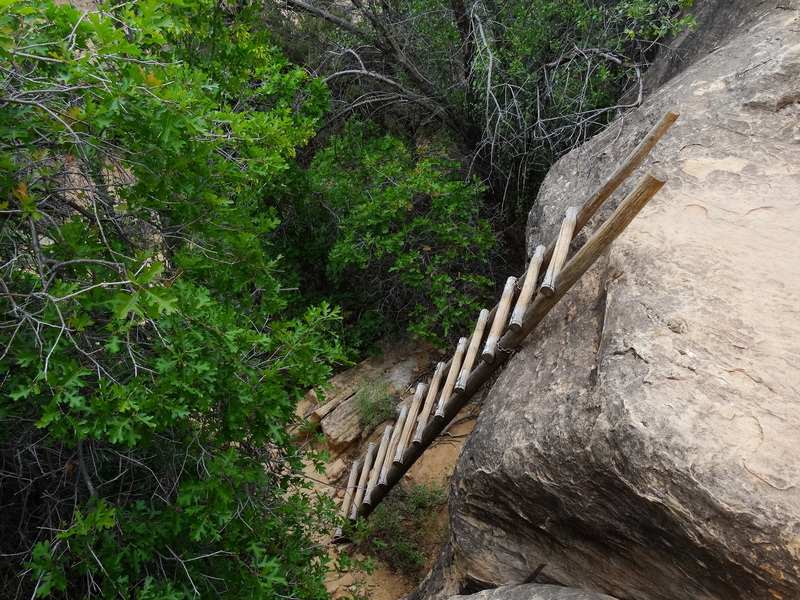 One of two ladders along Cowboy Springs Trail. 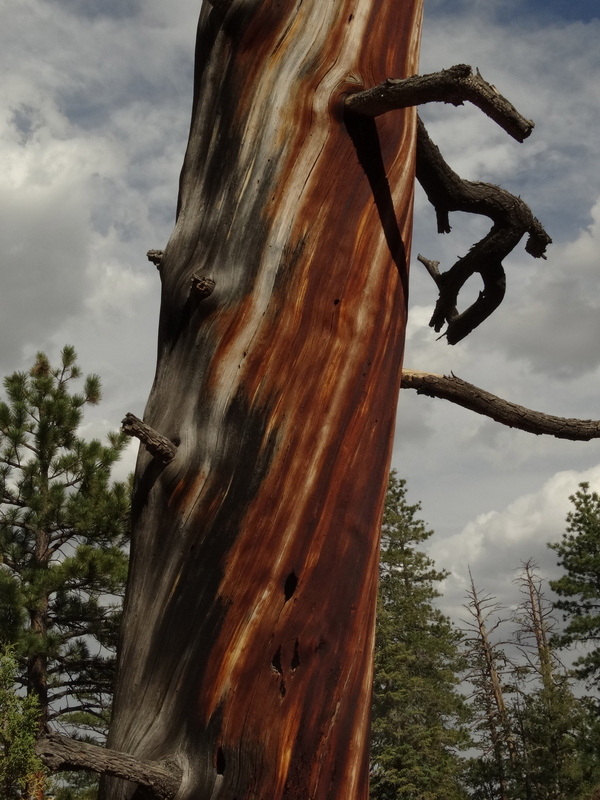 Our other stops throughout the park included the “Wooden Shoe Arch Overlook”, “Pothole Point” and “Big Spring Canyon Overlook”. The best part of the trip came at the end of the day when we decided to take the seven mile dirt road from the visitor center out to the Colorado River Overlook. The views from this road were stunning and we crossed paths with only one other vehicle and two hikers. We stopped to talk with the hikers to see if they were ok since they looked pretty worn out and shaky. They were six days into their hike; and for the past three days their only water supply was from muddy puddles. 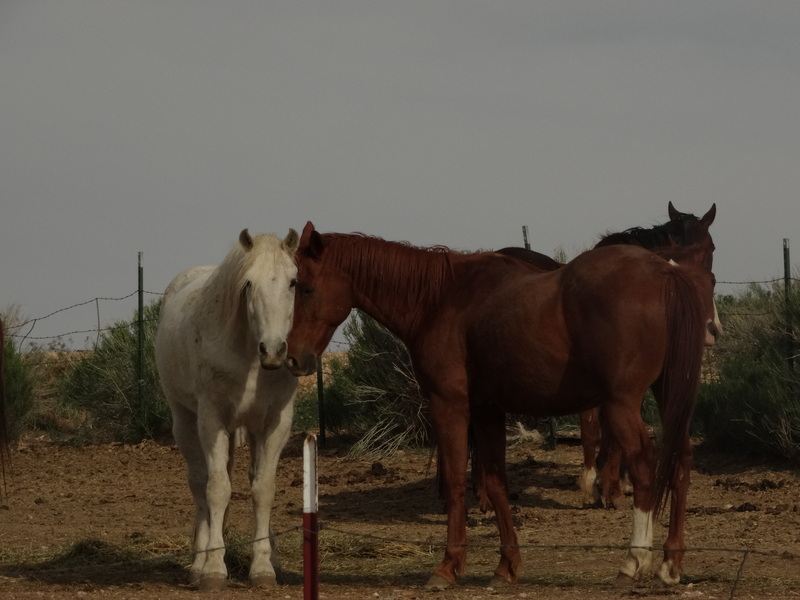 We loaded them up with four gallons of water which really perked them up! One of the ledgy sections of road out to the Colorado River overlook. We made it through this but the last mile was like this and worse. We came up a mile short of the overlook. Time was against us and the trail toward the end was taking us a long time to get through. Although we didn’t make it to the end the views alone were worth the trip. For my part, I continued to gain confidence in our vehicle and in myself along the way. I’m pretty sure that the two hikers we met were glad we came down this route as well! 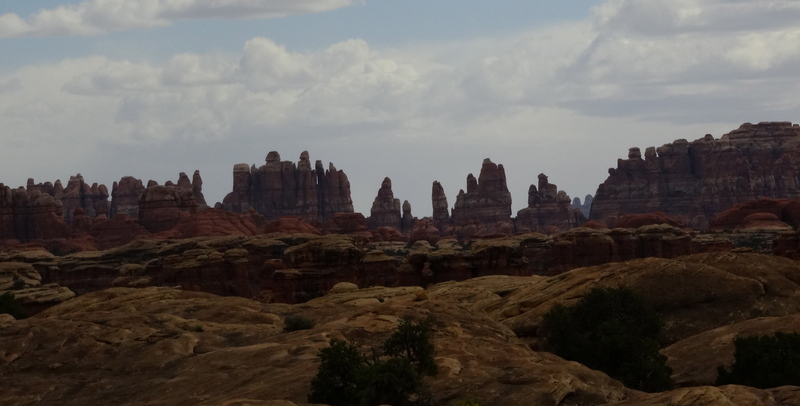 We returned to Canyonlands to complete our tour of the sights along the canyon rim. 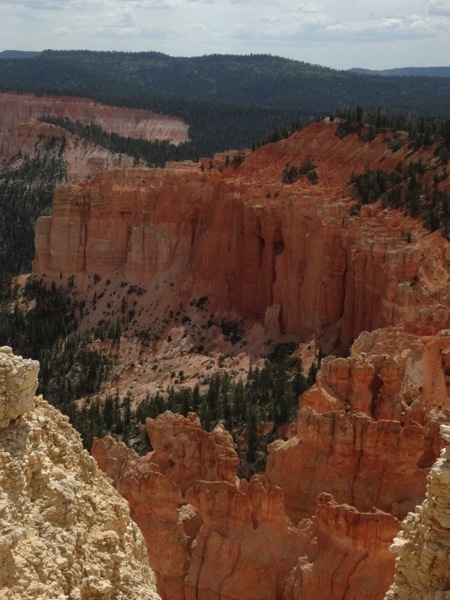 Our first stop was at the Shafer Canyon overlook where we had a great view of the trail that we drove the day before. Sheep herders used this trail to move their livestock lower into the canyon with a few losses along the way. 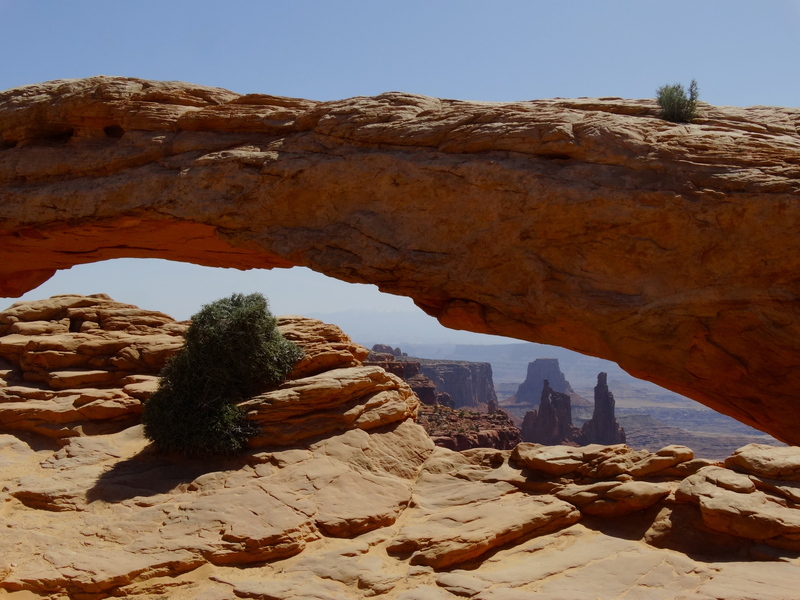 A short 1/2 mile walk takes you to this beautiful view at Mesa Arch. Darryl off in the distance on Elephant Rock. Upheaval dome the origin of which is unknown but thought to be either an eroded salt dome or exposed interior rock from a meteor impact crater. Photo of the “Grand Viewpoint” overlook. 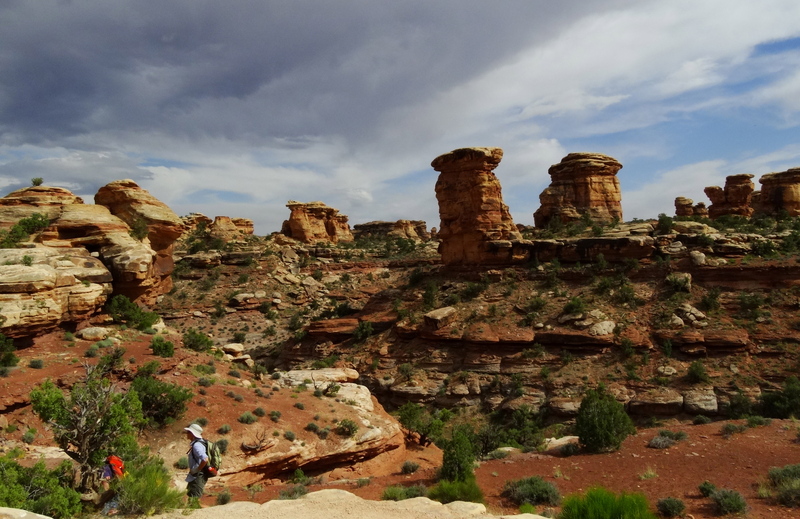 After Canyonlands, we went into town for lunch and then out Kane Creek Road to check out their 4×4 routes. Although we have visited Moab many times in the past, this was our first time on the trails along Kane Creek Road. From 190 in Moab, turn west onto Kane Creek Road (there is a McDonald’s at the intersection) and the road will eventually run along the eastern side of the Colorado River and then branches off into the canyons. 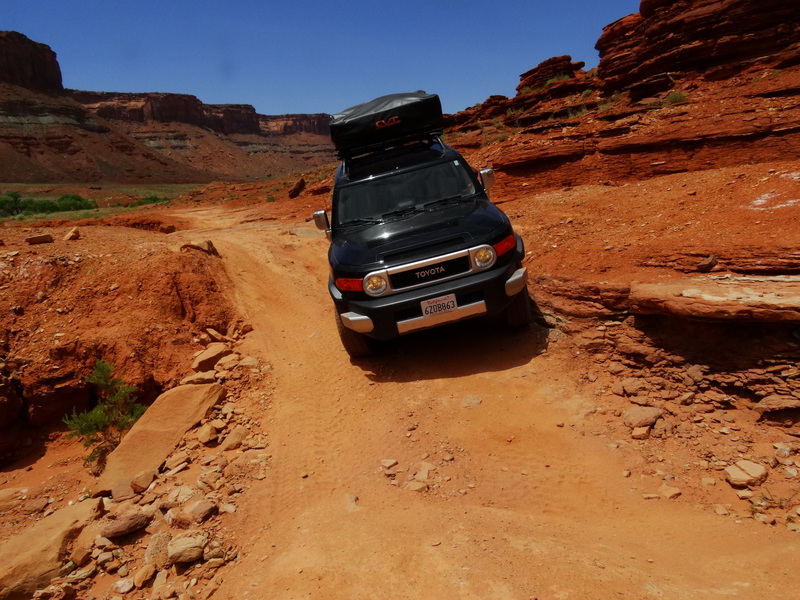 There are campgrounds along the way and eventually you’ll hit the Amasa Back trailhead. We took special note of this area for a future run! We continued along until we came across the sign for the Kane Creek 4×4 trails. After our reconnaissance of Kane Creek, we went back into town for a late lunch then out to find ourselves a place to spend the night. We opted for Sand Flats Recreation Area which is in town. It’s where the popular “Slick Rock” trails are located. We found perhaps the last site that was available which was at the entrance of “Fins & Things” 4×4 trail. The next morning we learned why the site was still available since it’s at the start of a very popular route and these people like to get out on the trail early! Nissan XTerras caravaning through Fins & Things trail. 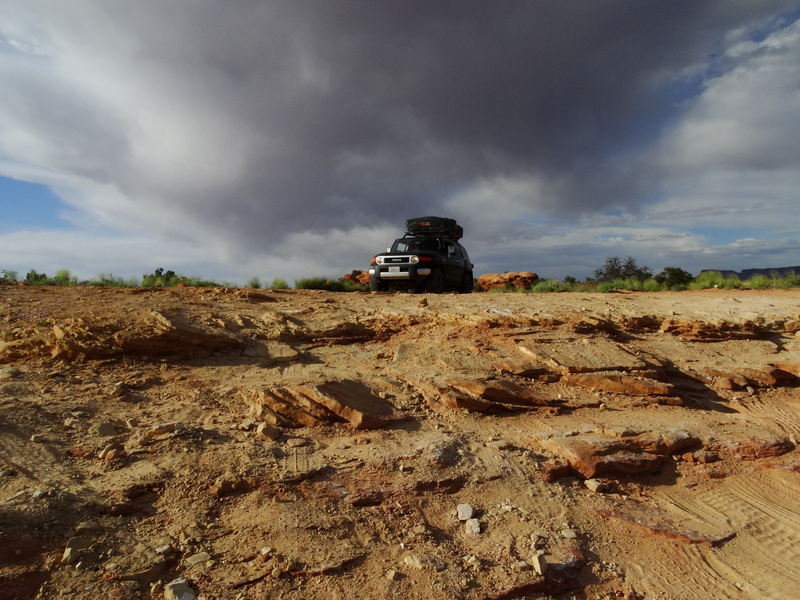 After our breakfast we started out to Kane Creek for our own 4×4 expedition. Darryl was patient with me as we walked through the more technical sections and discussed how we would drive through them. I actually stayed in the vehicle for most of the sections but I did get out to take some photos of the action. A UTV in the distance after it blew through a section that we were discussing. Darryl’s patience paid off since I got into the driver’s seat on the return and drove us back most of the way with Darryl standing on the road guiding me through the rougher sections. There was a point where I had just one front and one rear tire in the air sitting at a precarious angle. Our FJ is AWESOME! Although I was at a pretty steep angle, the FJ felt solid and I felt completely confident in its ability to get me through the section. No photos of this, you’ll just have to believe me. 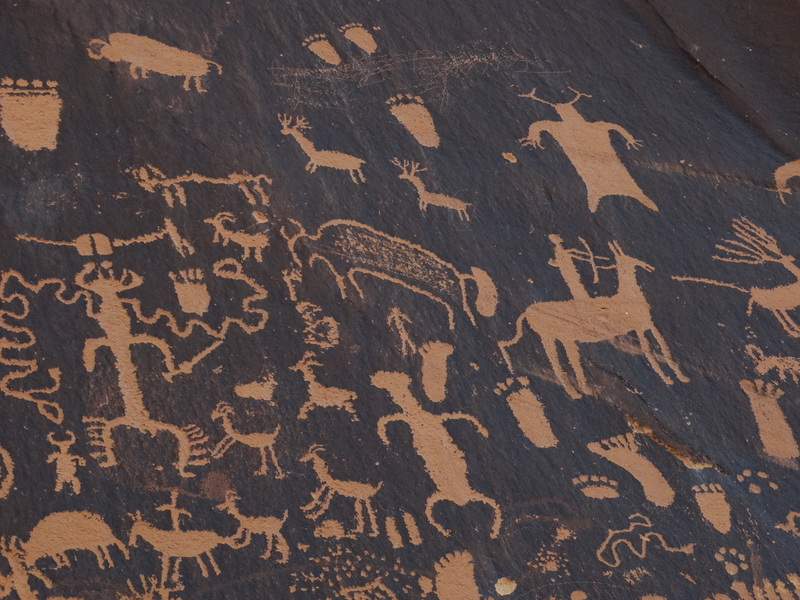 On our return, we stopped at the petroglyphs and snapped a few photos. What an awesome day! Sunset at Sand Flats campsite. 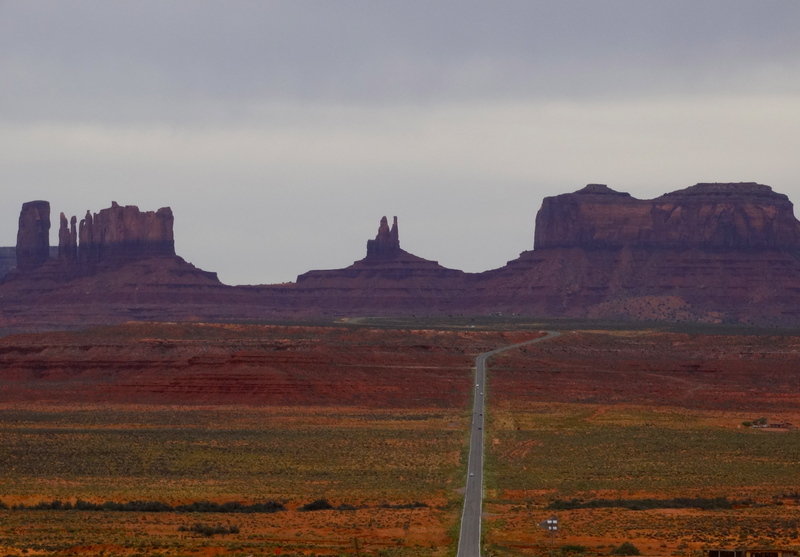 From Monument Valley we drove north along highway 163 hooking up with 191 which drops you into Moab. It’s a pretty barren area to drive through but there were a few stand-outs along the way. 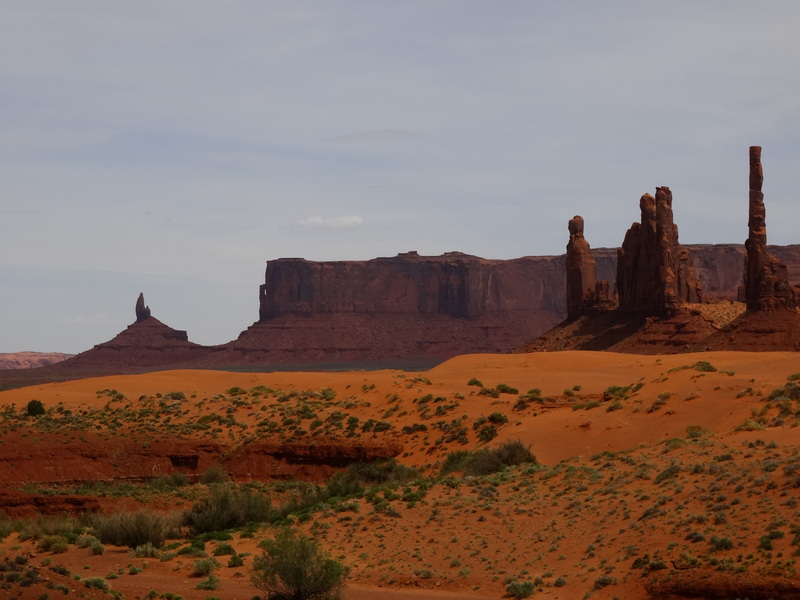 The first was the area around Mexican Hat, U just 23 miles outside of Monument Valley. We stopped just long enough for me to take this photo. I looks like a destination for campers and fisherman. We saw a number of RV’s along the San Juan River. The area is beautiful but a little too remote for most people. We finally arrived in Moab toward late evening so we went straight to the local Thai Restaurant. Darryl went in before me, alone, and asked for a window table but was told that they won’t seat him there. We couldn’t find any reason for this given that there was nobody in line after us and there was plenty of empty seating. She even told the person who seated him that he was NOT to be put at the window table. I arrived a little later and we had our meal and left feeling pretty annoyed at the inhospitable treatment. They did seat another couple at the window table shortly after I arrived. We definitely won’t be going back there again! After dinner, we went to find a campsite along the Colorado River. I was really looking forward to this since the views are spectacular. We’ve been coming to Moab for years but we always stay at Red Cliffs Lodge which is about 20 miles outside of town along the Colorado River. Now we would be camping on the river in a few minutes!! Not so fast…unfortunately, there was not a single campsite available at 10 pm. We should have known better given that we were visiting during their high season. We drove to Arches National Park and were immediately met with a “No Vacancy” sign on our way into the park. This is not looking good. 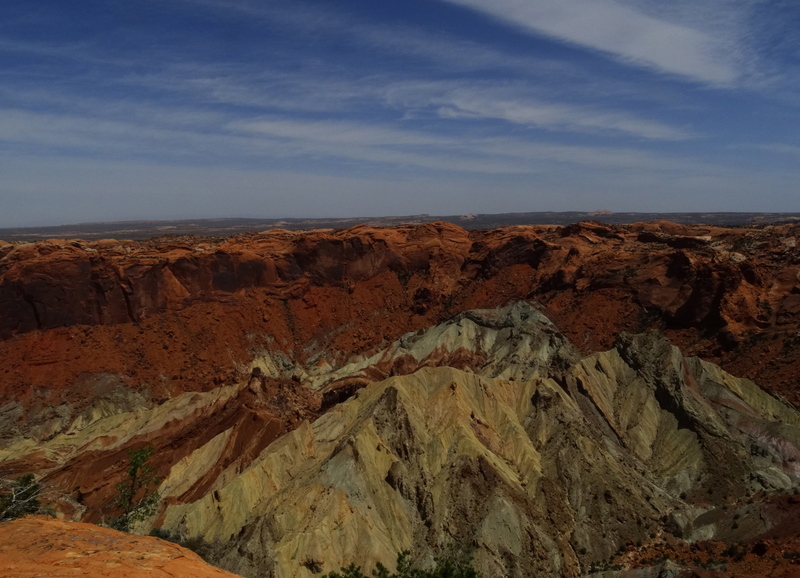 Our next option was Canyonlands which is a little further out of town so we should definitely have luck here! Nope, all sites were full. As we were considering our options we drove past a motorcyclist who was stopped along the dirt road. We asked him if he was ok, and he replied “Yes, just talking to my wife on the phone. Are you looking for a campsite? I know of a perfect spot for you!” Awesome!! He said his good-byes to his wife and then we followed him out to BLM land where he showed us a perfect spot for our home for the night. We ended the evening on a good note with some help from a stranger. Since we were just a short drive to the entrance to Canyonlands, we made this our first place to spend the day in Moab. 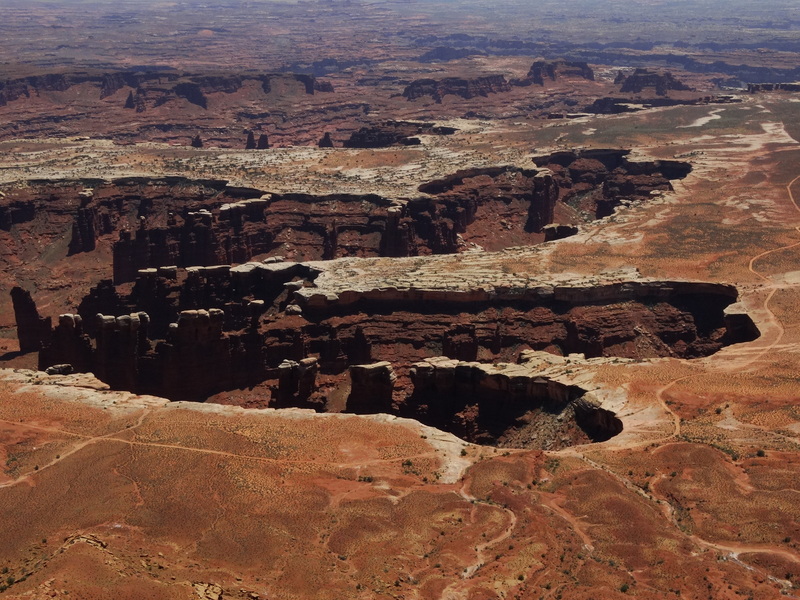 There is a drive along the rim of Canyonlands that provide some beautiful views of the park. We could see the infamous White Rim Trail which we talk about mountain biking one day. On this trip we considered driving it. The road is 100 miles long and winds its way around the Island mesa top. It can take 2-3 days in a 4×4 and up to a week on a mountain bike. The really good riders do it in less than 24 hours! A view of Green River. Up to this point, we have been on pretty tame roads with the FJ. Darryl was looking forward to getting the FJ out on some real stuff to see how it handled. Me? Not so much…but I was warming to the idea. I saw those beautiful roads winding through the valley and couldn’t imagine leaving Moab and not getting on them. 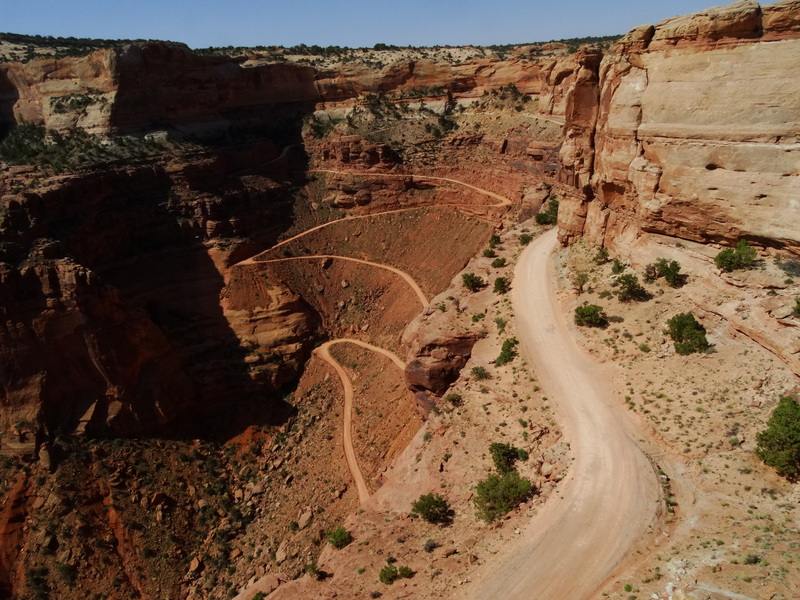 After studying the map for about a nanosecond, I’m not much of a map reader, the Shafer trail caught my eye as an alternate way back to town with the added bonus of driving through a portion of Canyonlands. I went to talk with a ranger about the road conditions and what we should expect. Darryl was all in but I was still hesitant to do anything too aggressive. 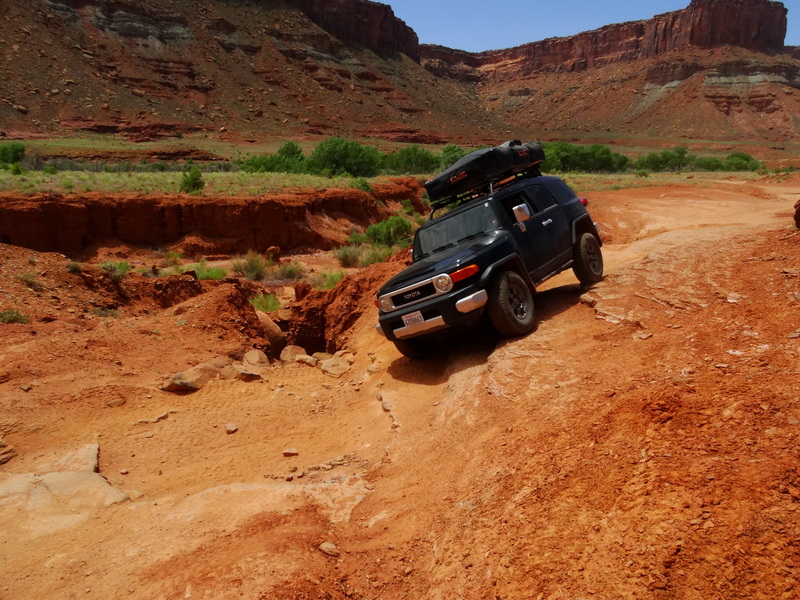 Let’s just say that I like to keep all four wheels on the ground but I was determined to push myself out of this comfort zone, otherwise why buy an FJ Cruiser?! The ranger told me that this would be a perfect road for me to get comfortable with the terrain and that there was absolutely nothing that our car couldn’t handle. I’m sold! But I’ll stay in the passenger seat…for now. This photo is taken just past where Thelma and Louise drive off the cliff. 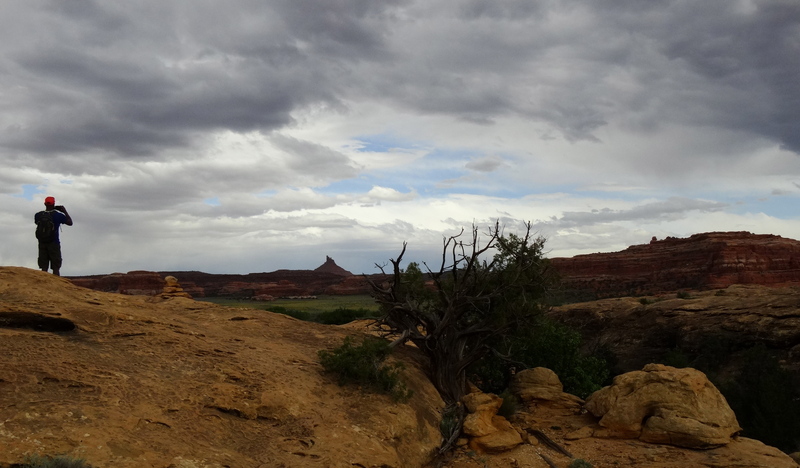 We took almost 3 hours to drive the Shafer Trail to Potash trail which drops you into Moab. This distance is roughly about 35 miles but we stopped a lot to take photos and enjoy the views. These photos don’t do it justice but I can say that the day was amazing. We ended our day back at our lovely BLM campsite from the night before. 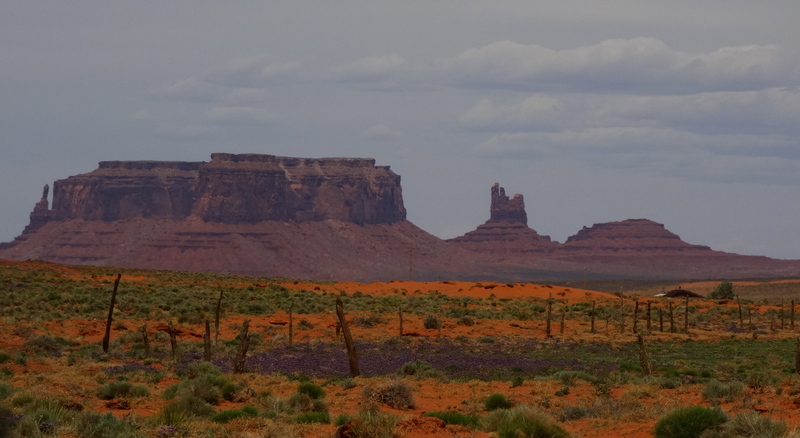 We are now entering the Navajo Nation portion of our trip. 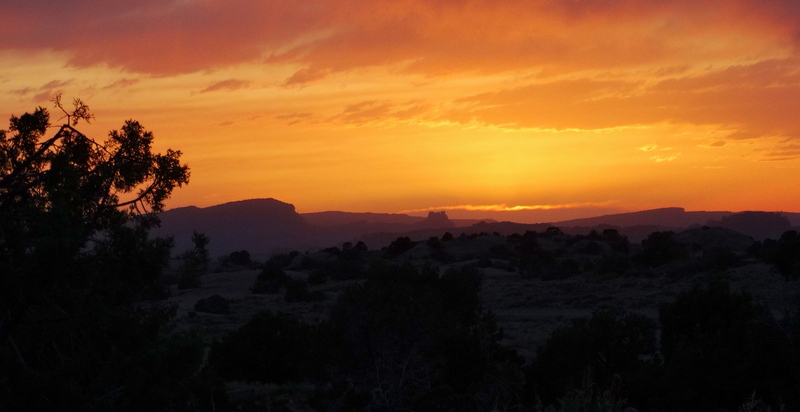 Our first stop was at Navajo National Monument where we spent the night at Sunset View campground. Their campgrounds are free they are on a first come basis and flush toilets are available. We arrived late so we just set up camp, had dinner then went for a walk around the campground. During our walk we met the man who was in Darryl’s “morning kayaker” photo the previous morning at Lake Powell. It’s a small world! 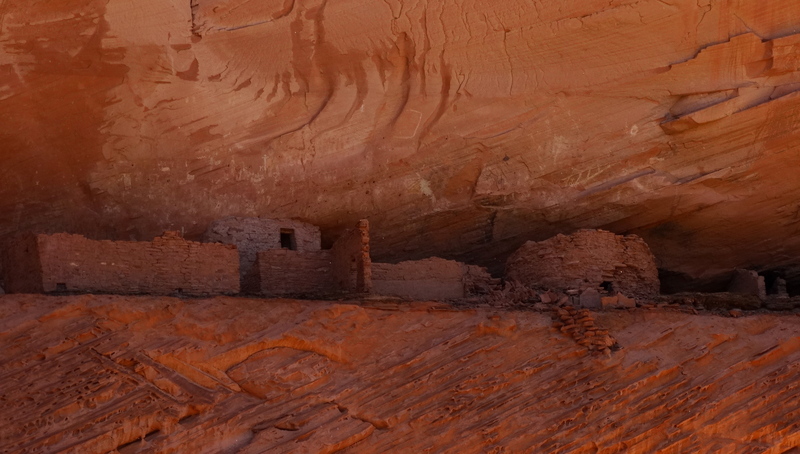 The following morning we decided to stop in at the visitor center to inquire about their guided tours to see the Betatakin ruins which are only accessible with a Navajo guide. Unfortunately, we arrived two weeks too early since their tours don’t start until Memorial Day weekend. 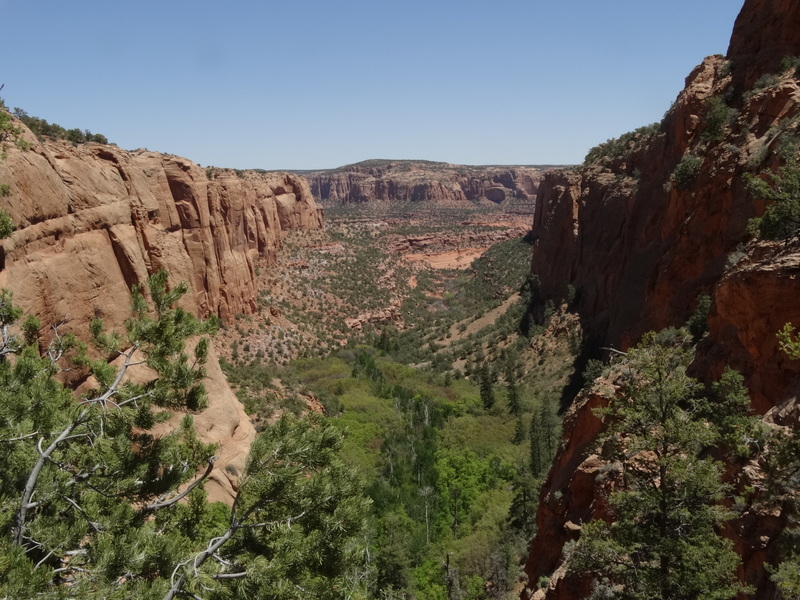 But we were able to hike the three relatively short rim trails (Sandal Trail, Aspen Trail and Canyon View Trail) to enjoy the views of the canyons and get a peak of the ruins from the Sandal Trail. A closer view of the Betatakin ruins. 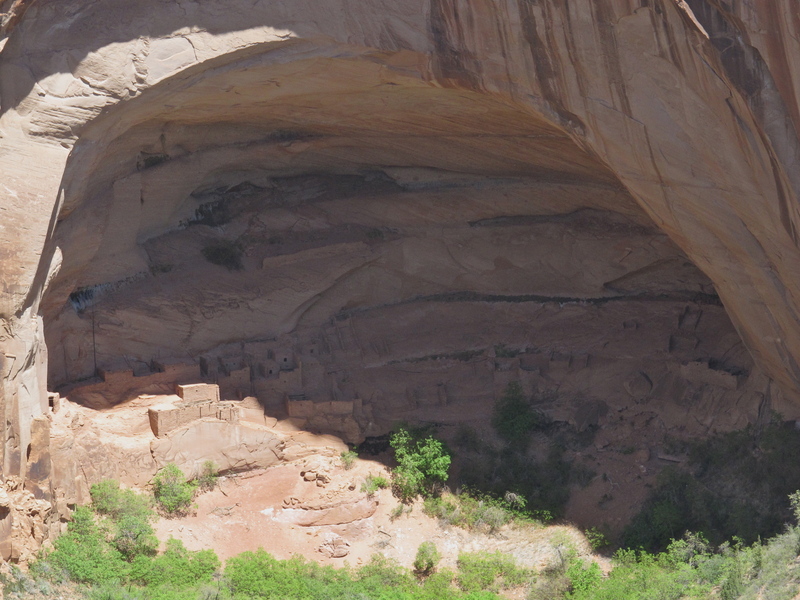 These ruins were occupied by the Ancestral Puebloan people dated back to 1250-1300. It is thought that up to 150 people were living here at its peak. The reason for their departure is unknown. 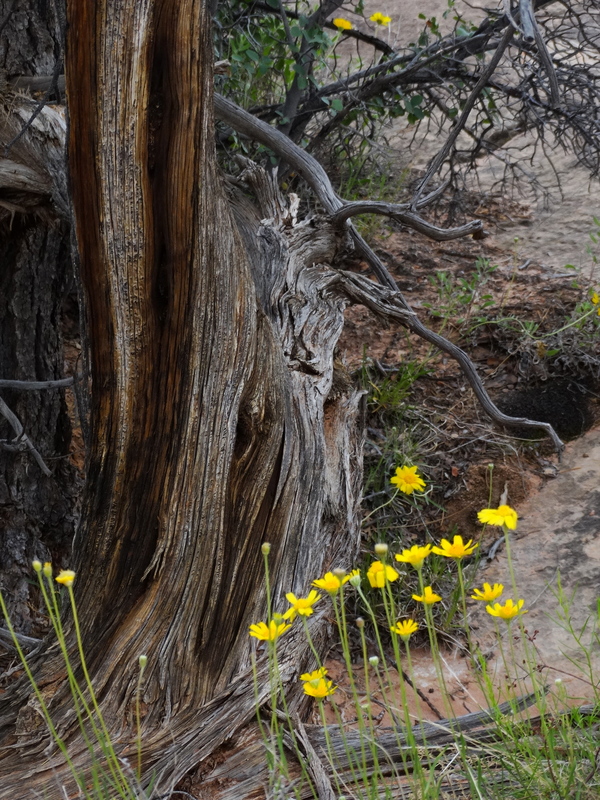 Hiking here is a beautiful and solitary affair. We shared the trail with only one other person. It was nice to be away from the crowds in Lake Powell and enjoy the peace within the canyons. View of the ancient aspen forest from the Aspen Trail. 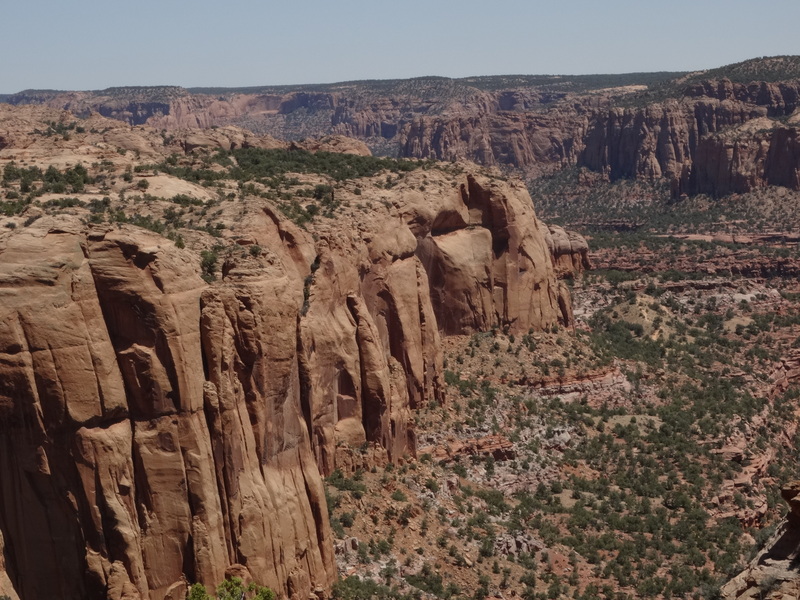 After our morning hike in Navajo National Monument we drove to Canyon de Chelley National Monument. 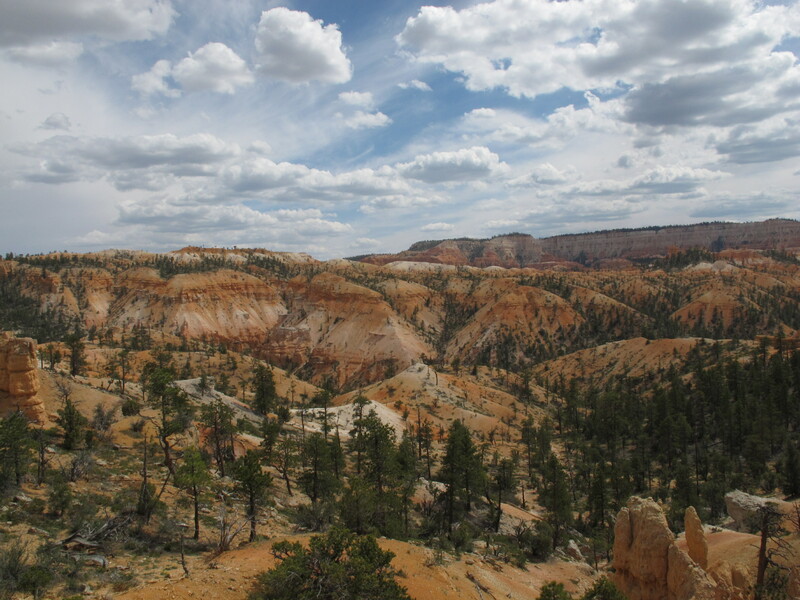 We took in the views from the lookout points along the canyon rim as we drove to our next camp site at Spider Rock Campground. 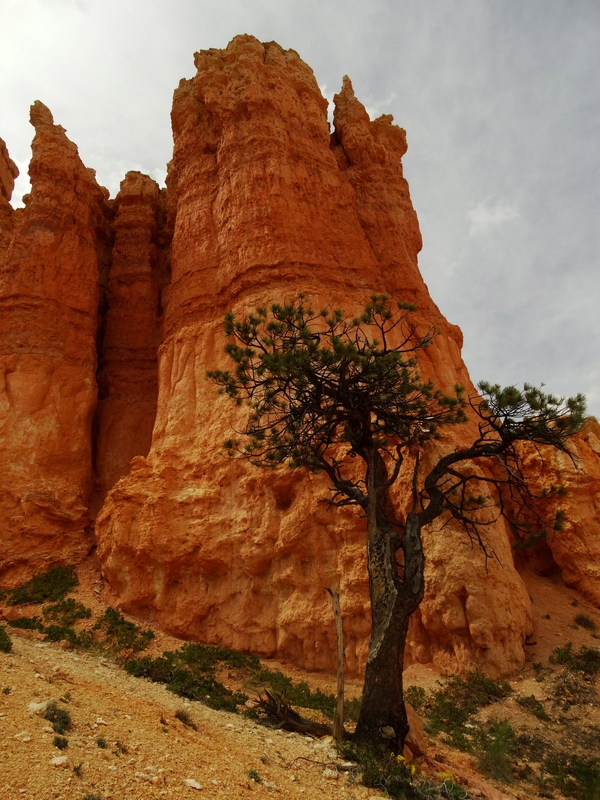 Spider Rock is a family owned campground at the far end of South Rim Drive, 10 miles south of the visitor center. I had my first taste of fry bread made by Howard’s grandchildren (Howard is the owner). The fry bread was ok but then again, I’m not a huge fan of bread of any kind so you should try it for yourself if you have a chance. The facilities are quite rustic but there are bathrooms and solar heated showers available. 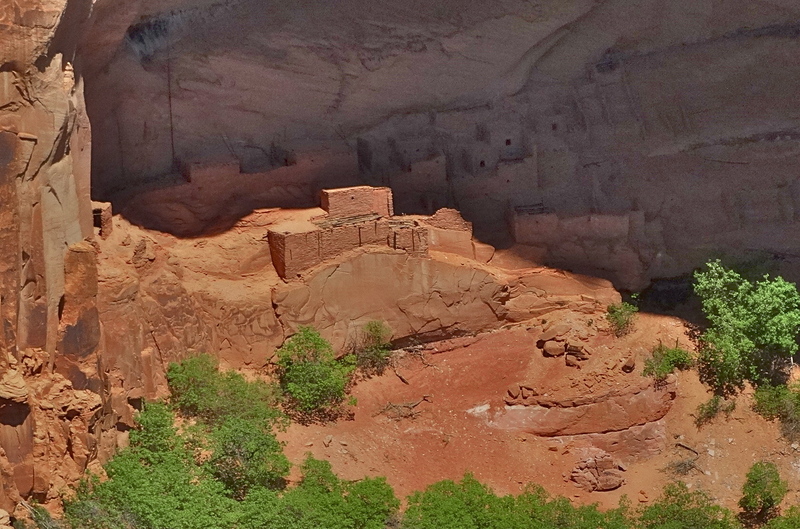 We hired a Navajo guide to take us on a tour through the canyon on the following day. 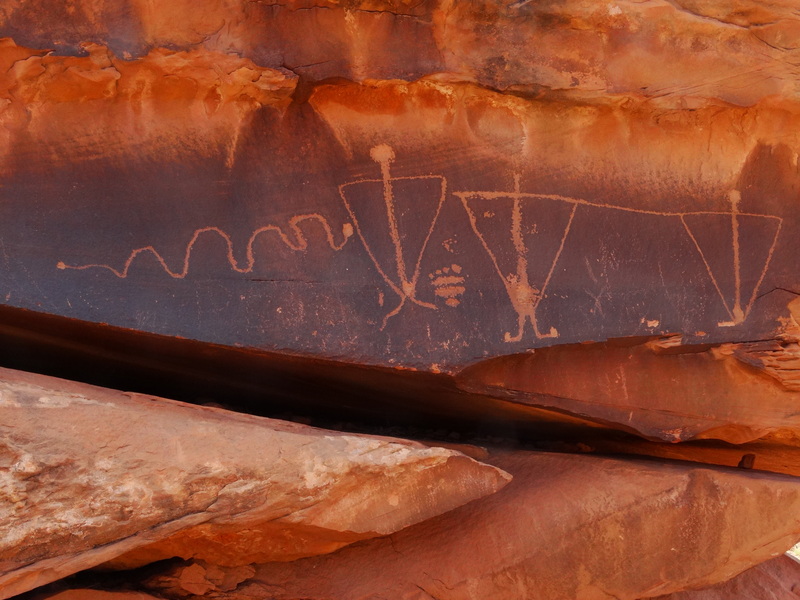 All visitors into the canyon must be accompanied by a licensed Navajo guide. 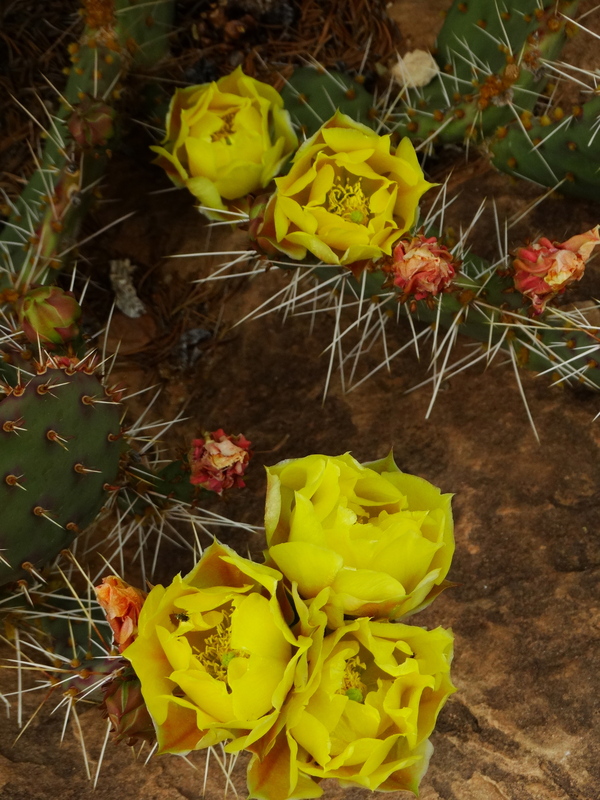 Tully Yaazi, our guide, grew up in the canyons and he still farms a small ranch in the canyon. 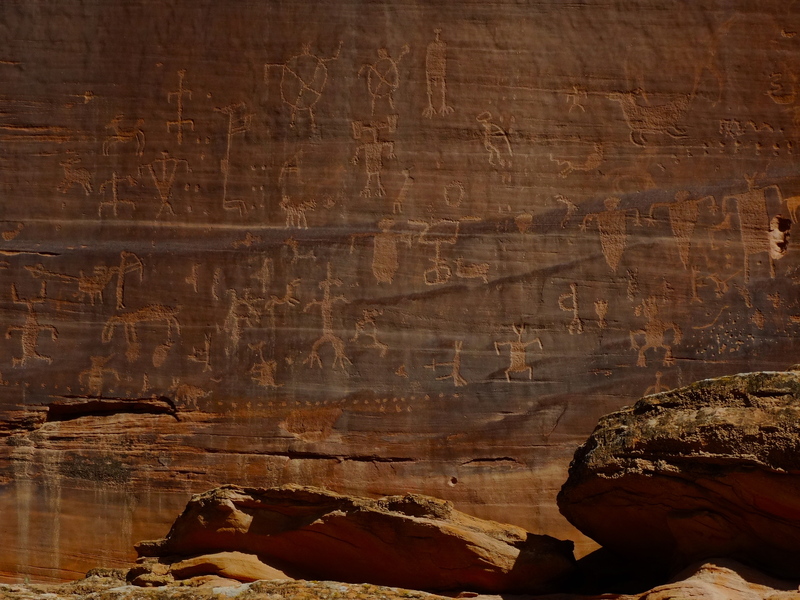 He shared with us stories about life in the canyon as he drove us through the canyon to get a closer view of the ruins and the petroglyphs and pictoglyphs that could be found throughout. Antelope ruins named for the pictographs of antelope at this site. 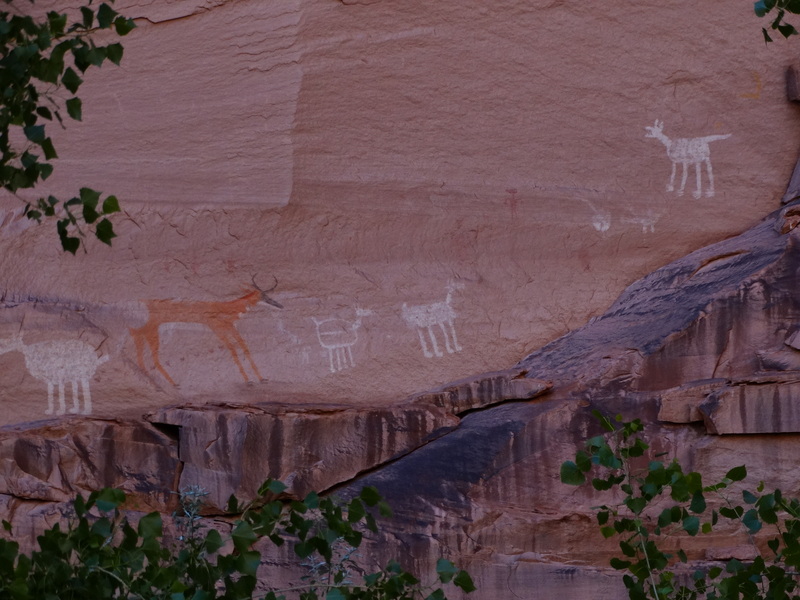 Antelope pictographs that gave Antelope Ruins its name. 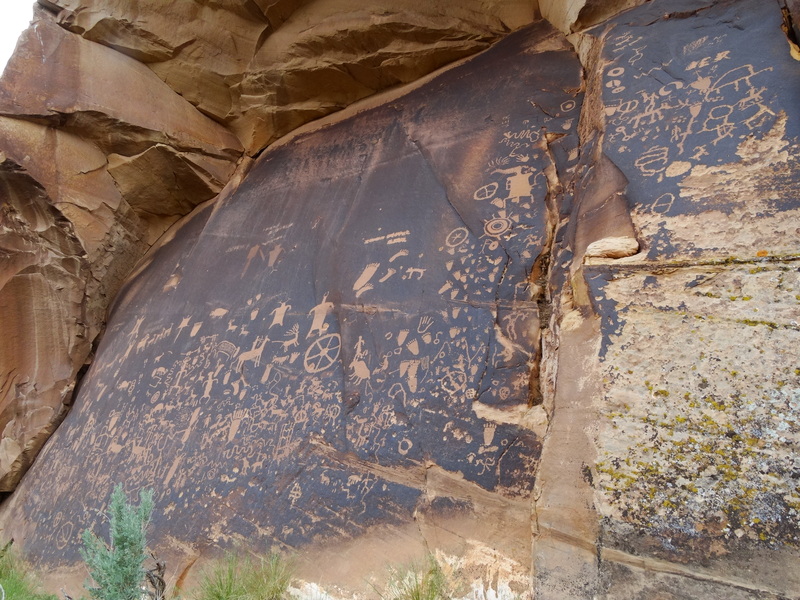 Named “Newspaper Rock” because different styles of petroglyphs are present spanning hundreds of years. After our tour with Tully I had just enough time to take another tour of the canyon but this time on a horse! 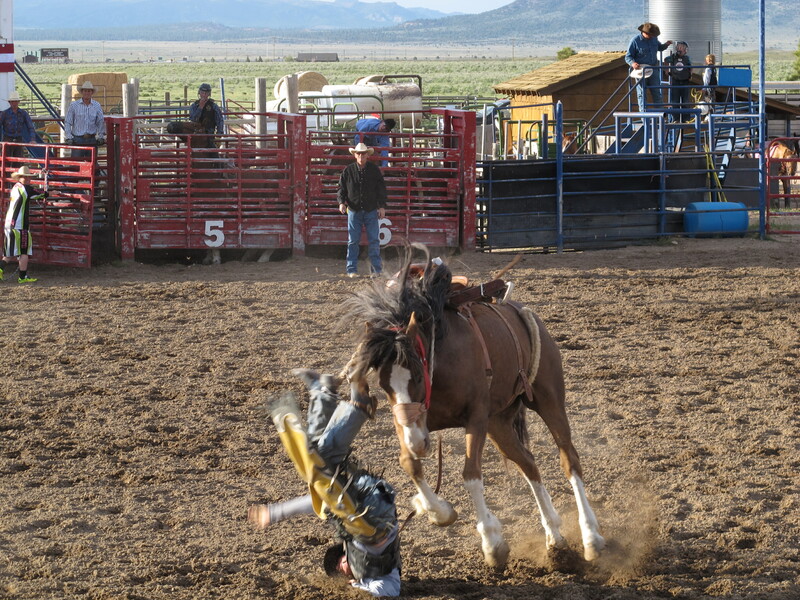 I was lucky enough to ride this beautiful mustang named Sherman. It was basically a private tour just to “First Ruin”. 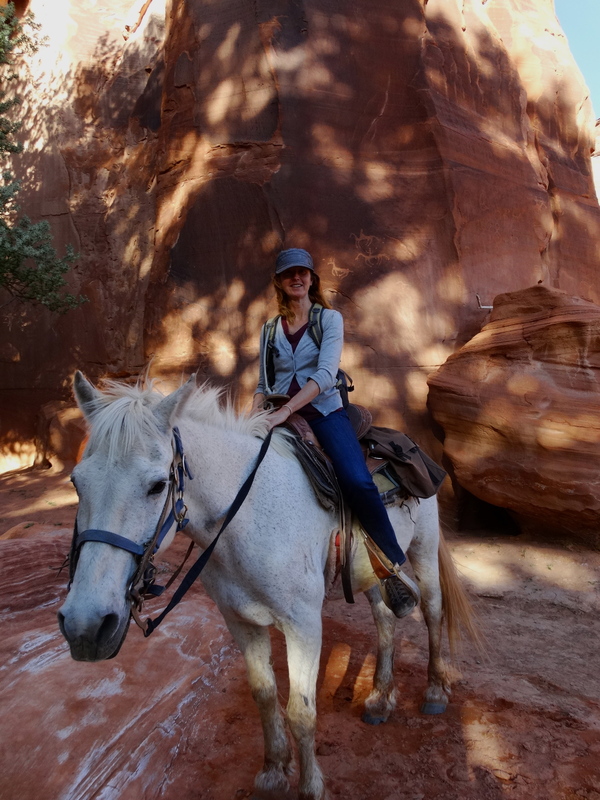 Riding through the canyon on horseback was a wonderfully peaceful way to experience the canyon. 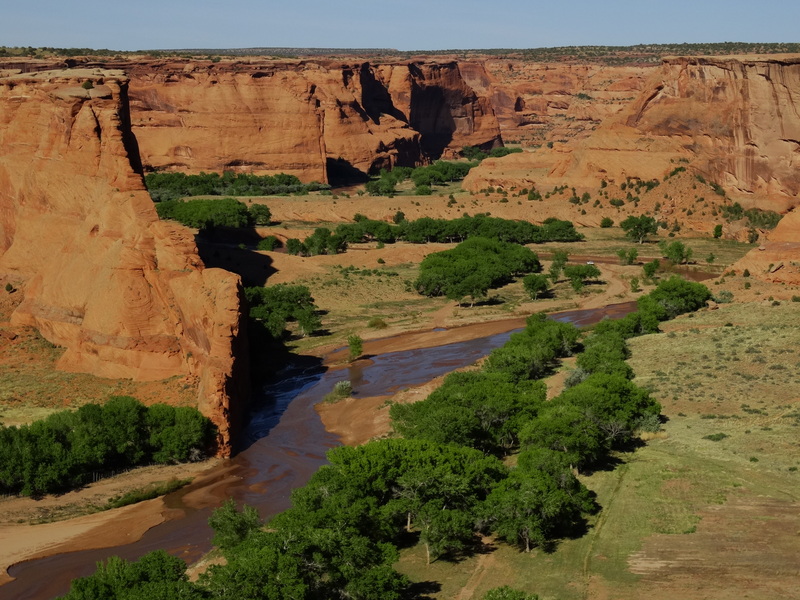 Sherman and me exploring Canyon de Chelly together. 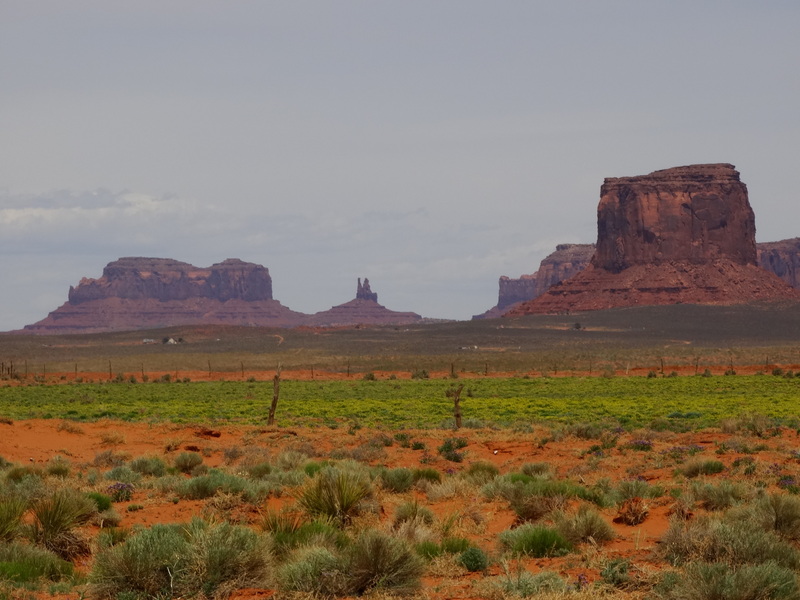 Our next stop on our Navajo Nation tour was Monument Valley. I have looked forward to this day for many years! 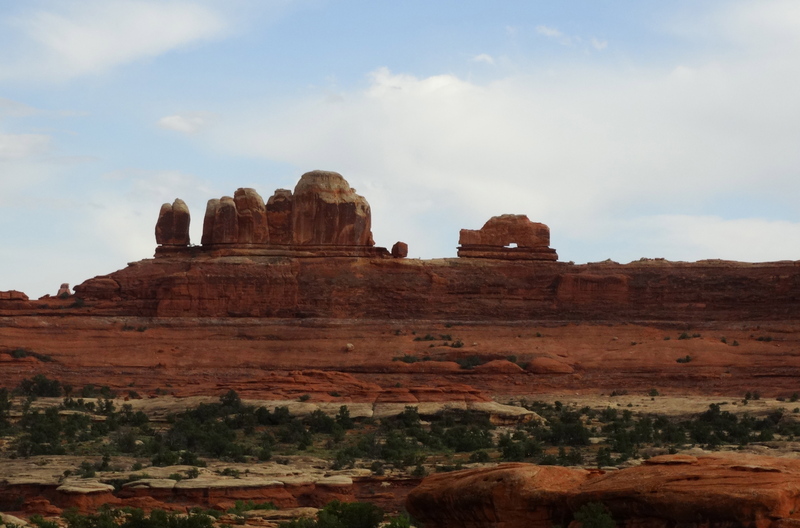 I loved driving through the valley and photographing these massive monoliths. If we come back through we will definitely stay in one of the campsites within the valley to have it to ourselves rather than sharing the roads with a couple hundred other tourists. Our last view of the valley.